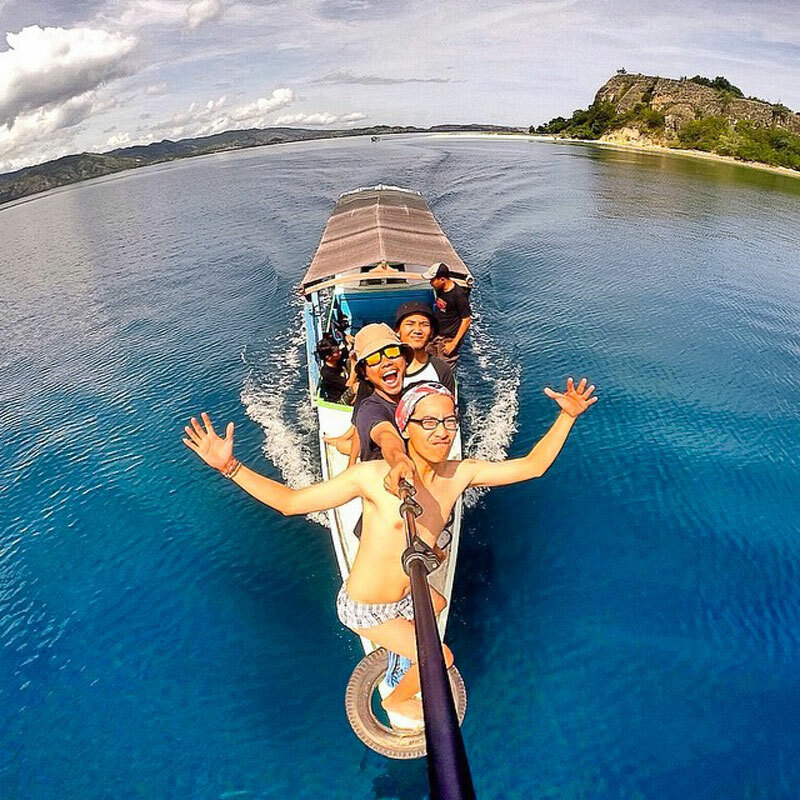 Many people say that Flores is distinctly different from the rest of Indonesia. 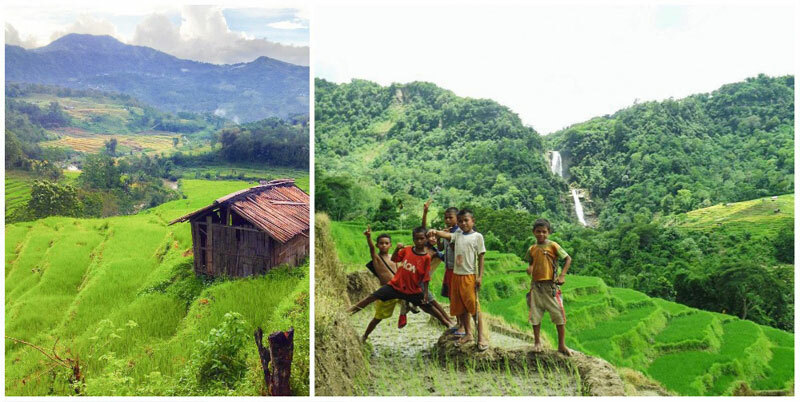 There’s something unique and exotic in these untouched lush green hilly landscapes dotted with villages, where centuries-old tradition and heritage are still preserved and are still very real as part and parcel of the locals’ lifestyle. When we first stepped into Flores (which means ‘flower’ in Portuguese), we were very heartened by the friendly locals, and it often felt as though we were some of the few rare foreign travellers there. People were smiling and kids were calling out “Hello how are you?” every time we passed through a local village. Here, the most delicious grilled fish isn’t served in an expensive restaurant but in a simple warung on the shore. 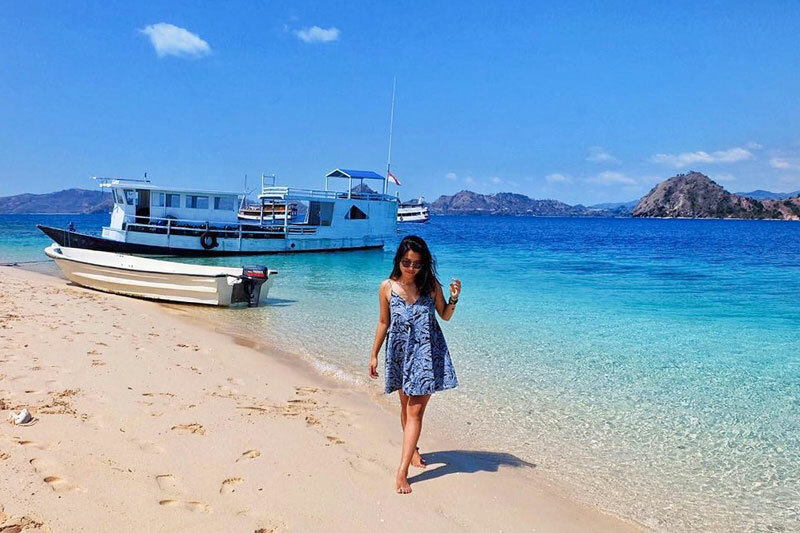 You will hardly find any luxurious resorts, but if you want to see and experience the local life with all its traditions, Flores is a place for you. Getting thereGetting AroundWhen should you go? 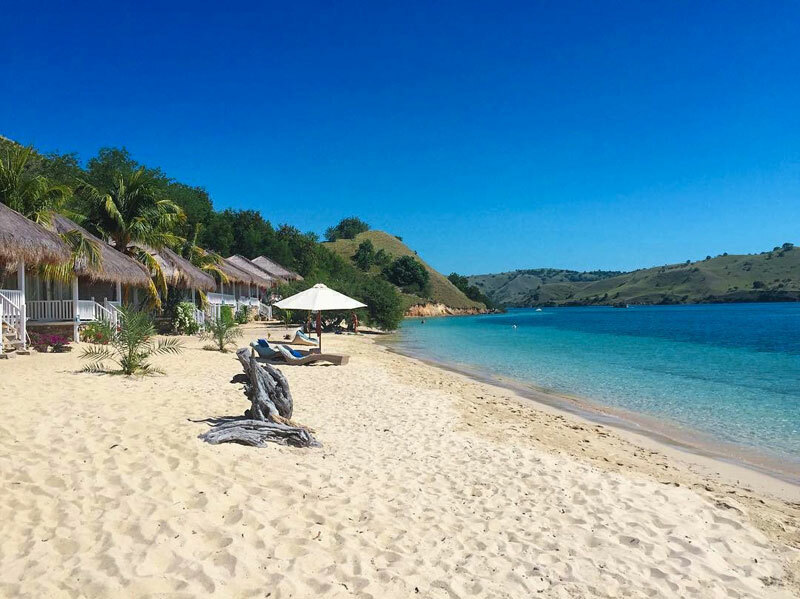 The first stop for most tourists is usually the port village, Labuan Bajo. 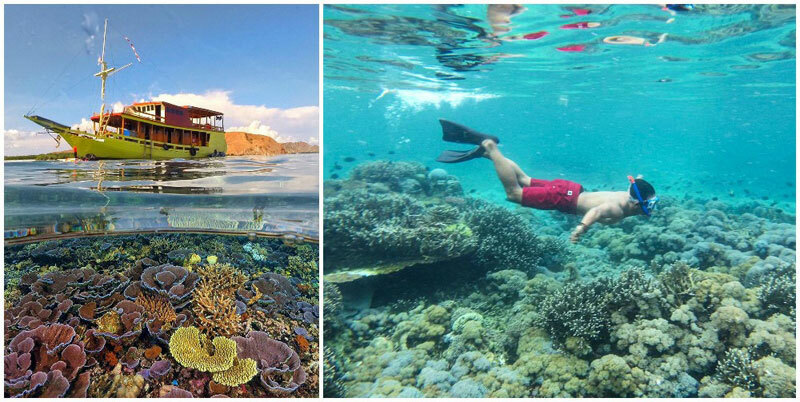 From there, you can organize a boat trip to Komodo National Park, other islands or some diving spots. 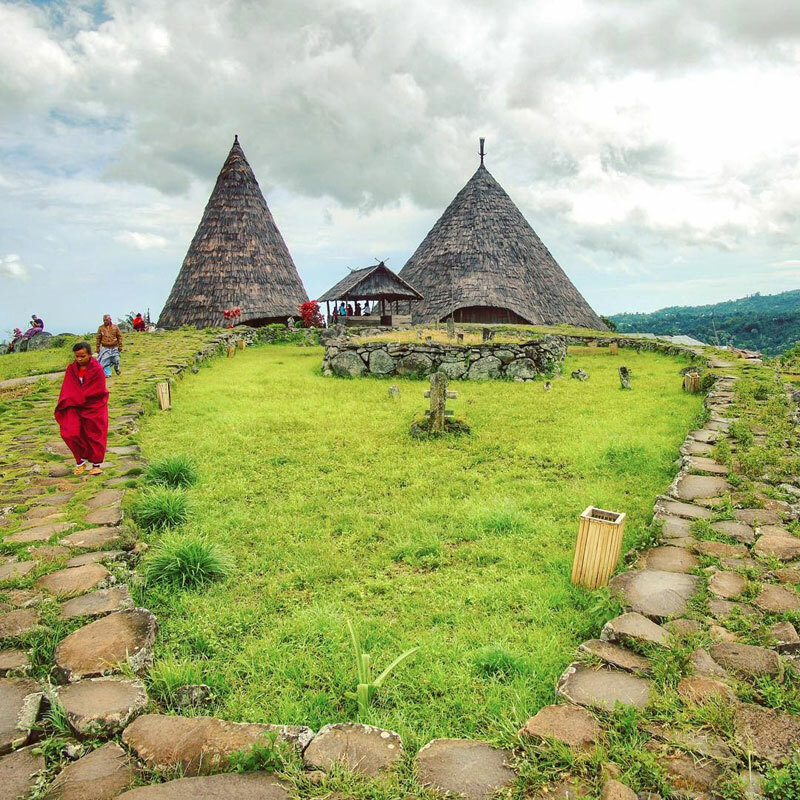 You can also find a guide and explore the further west and end your trip in another city where you can fly out directly (such as Maumere and Ende, which have airports). 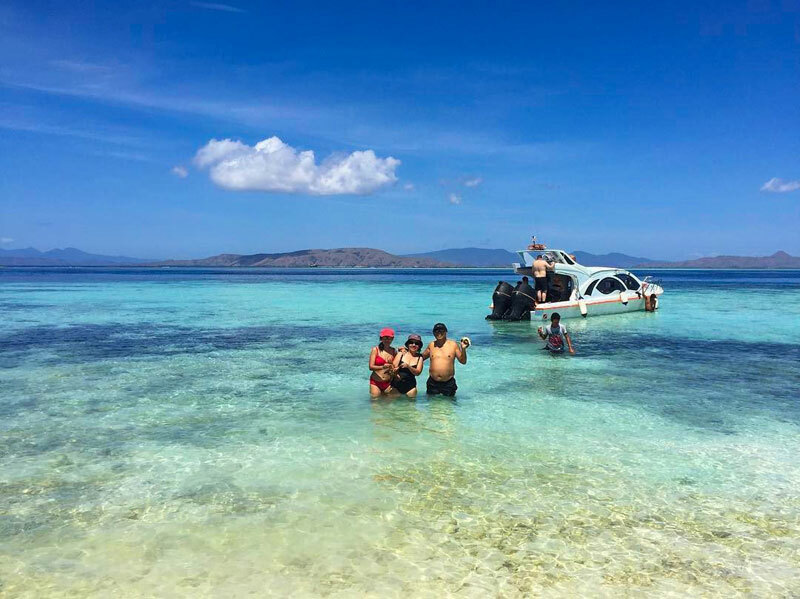 Public transport in Flores is usually very crowded, slow and unreliable, so the easiest way to travel around is to hire a car with a driver and go on a road trip. The trans-Flores highway connecting the west with the east is generally pretty well-maintained, but when you venture into smaller roads, be prepared for rocky paths that may be a little dangerous at times, so if you are just renting a bike, do be careful! In Flores. the wet season starts in December and the rains last until March, and from April to November you can expect hot dry summer. If you want to avoid tourists and still enjoy good weather, plan your trip from April to June before the high season starts, or from September to November, after it ends. Keep in mind that some attractions such as waterfalls, hot springs or mountain hikes may not be accessible during the wet season. 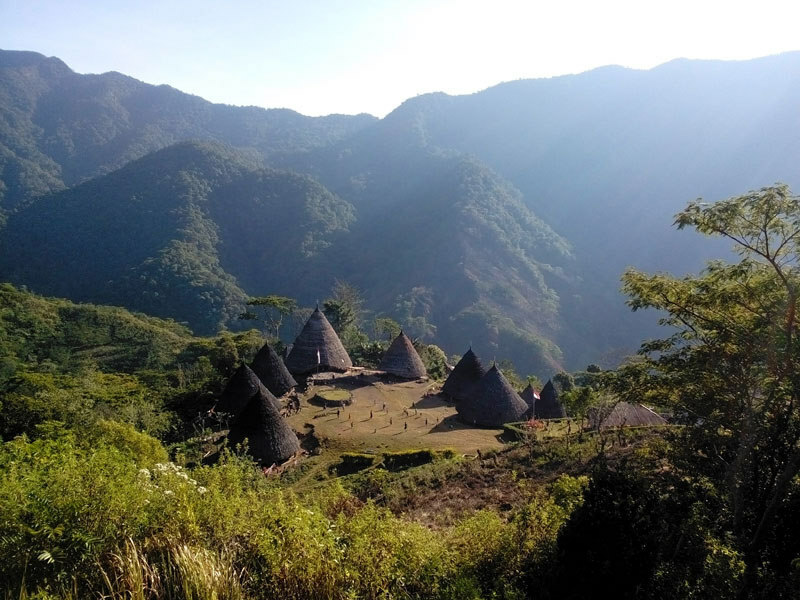 Regardless of whether you’re a diver, beach person, passionate hiker, or purely interested in geology, archeology or traditional cultures, Flores will have something for you. 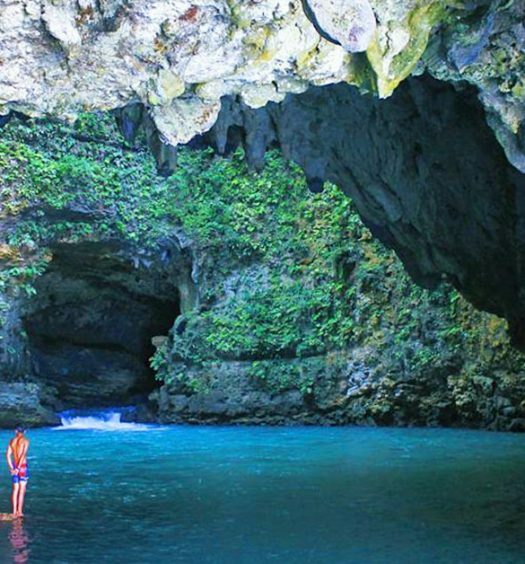 Let us show you the most exotic wonders Flores has to offer. Are you ready for the adventure? 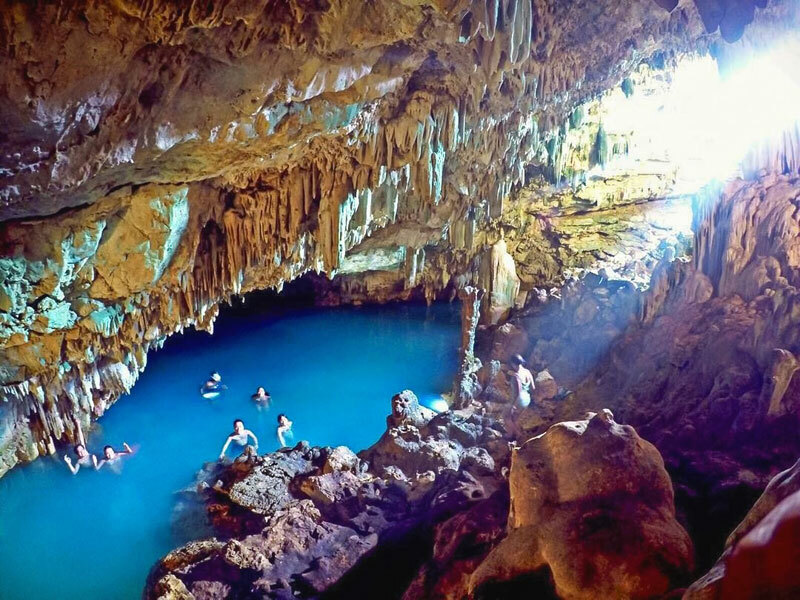 Few have heard about this recently discovered four-metre-deep cave, which hides a splendid natural pool with cold, crystal clear water. The water contains a large amount of salt, so you can actually take a healthy bath! What else can you find there? Nature’s beautiful works of art, such as stalactites, stalagmites or fossils hidden in the cave walls. When the sunlight filters into the cave and the water begins to sparkle, it’s difficult to imagine a better pool to swim in! Looking for an accommodation in Maumere? 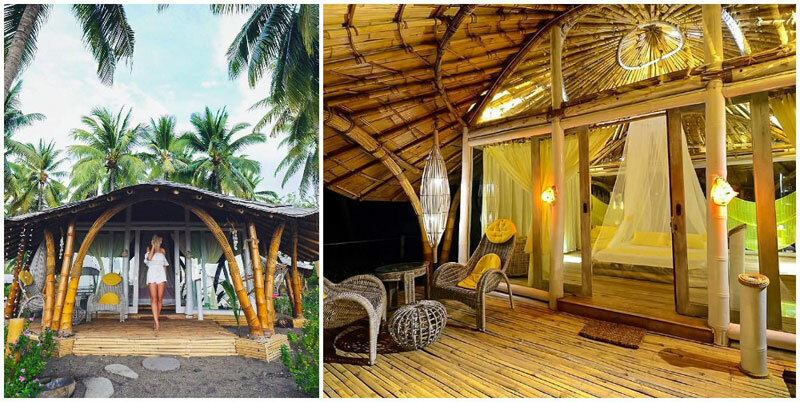 Lay your head in one of these funky bamboo bungalows. 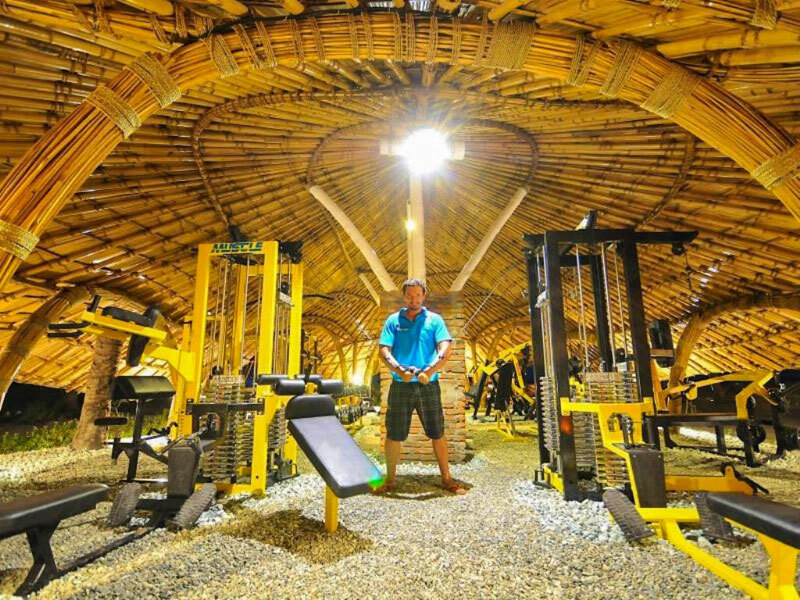 This resort has a semi-open gym, wicked swings, hammocks, and it’s right on the beach! 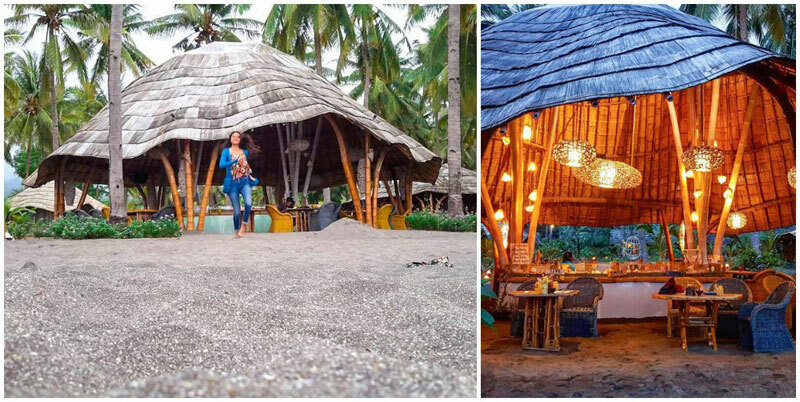 Under the bamboo penthouse, you’ll find a restaurant, where you can indulge in its specialty seafood and marvel over its creative food design. 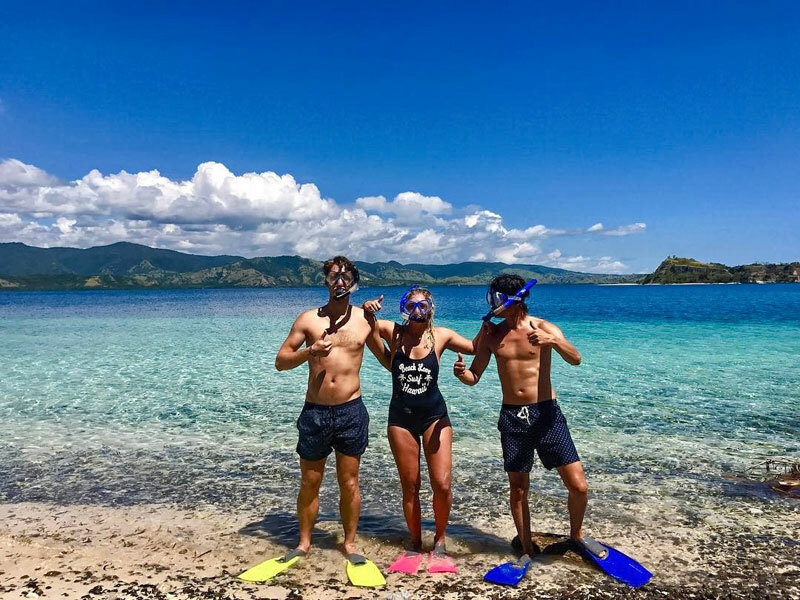 If you are keen to do activities such as horse riding, snorkelling and fishing or tour around Flores, the staff could help you organise them. 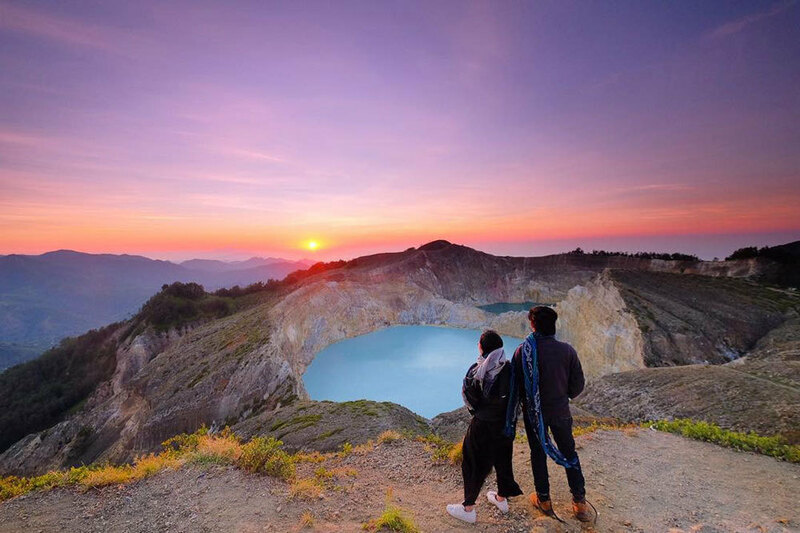 Mount Kelimutu’s three multi-coloured volcanic lakes, the crown jewels of Flores, offer hikers a bright reward. Each of the three lakes has its own colour, ranging from vibrant blue to muddy brown. 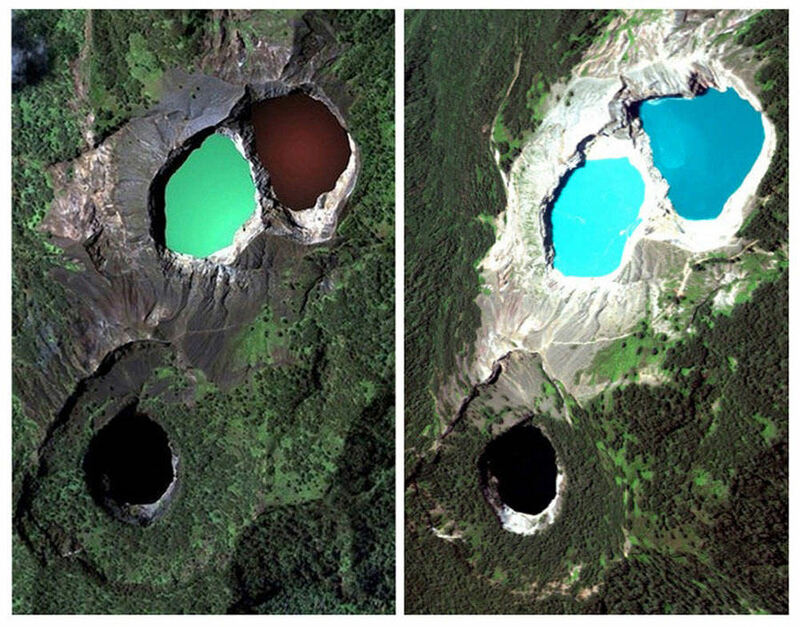 The lakes can change colour several times a year. As the top of Mount Kelimutu is often covered by impenetrable fog, hikers must begin early to reach the summit by sunrise. Most often, hikers catch an 8-seater truck version of public transportation between 3:30 and 4 AM. This truck drops passengers at the Kelimutu National Park parking lot. From there, it is a well-marked, 30-minute climb. Those who suffer from motion sickness might want to consider the longer hike. A 20-kilometre path leads to the lakes from Moni village. This takes at least 4 hours to climb. 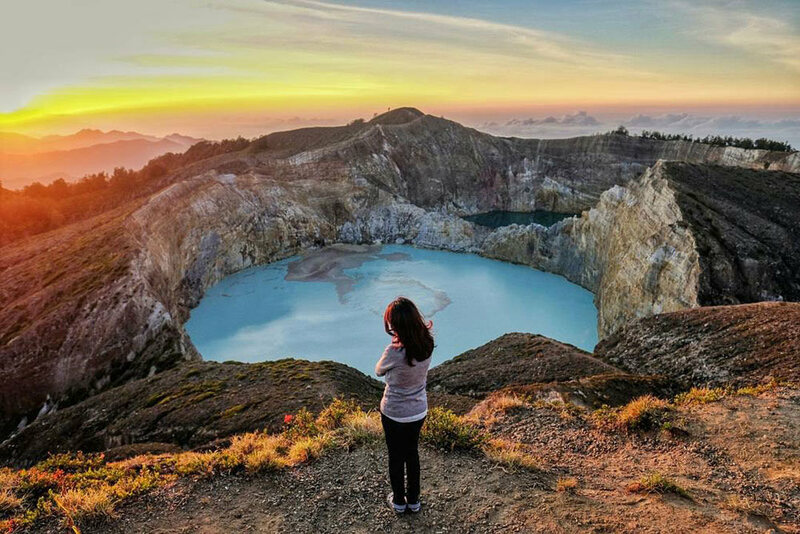 Kelimutu National Park is well-known these days, but the view of the three lakes from its only hike is so magnificent, you shouldn’t miss it even if you’re only looking for off-the-beaten paths. 4. 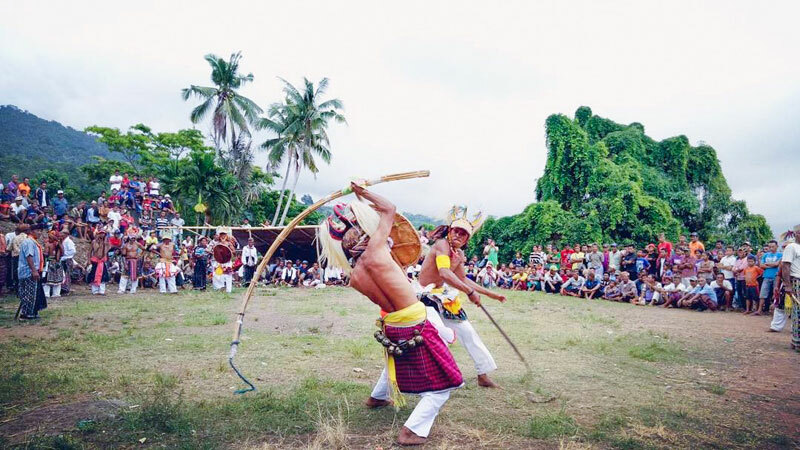 Watch the traditional Caci Whip Fight in Manggarai! 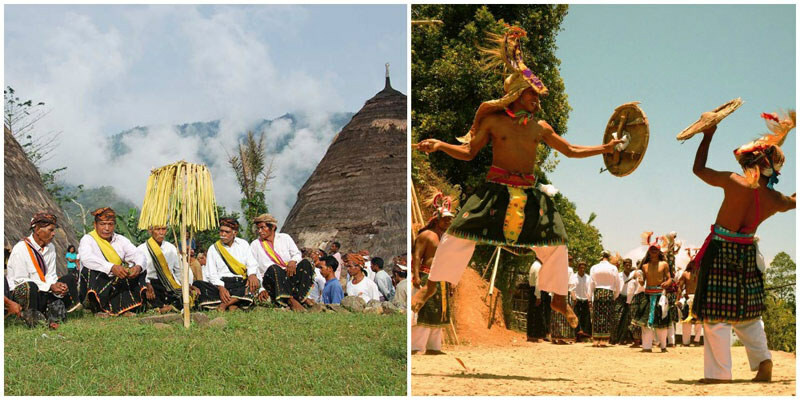 If you happen to be in Flores in mid-August, come visit Manggarai to watch this unusual ritual. And mind, this dance-fight is symbolic as well. The aggressor’s rattan whip symbolizes the male meanwhile the defender’s round shield represents the female element. Whenever the whips meet, the female and male elements are united. 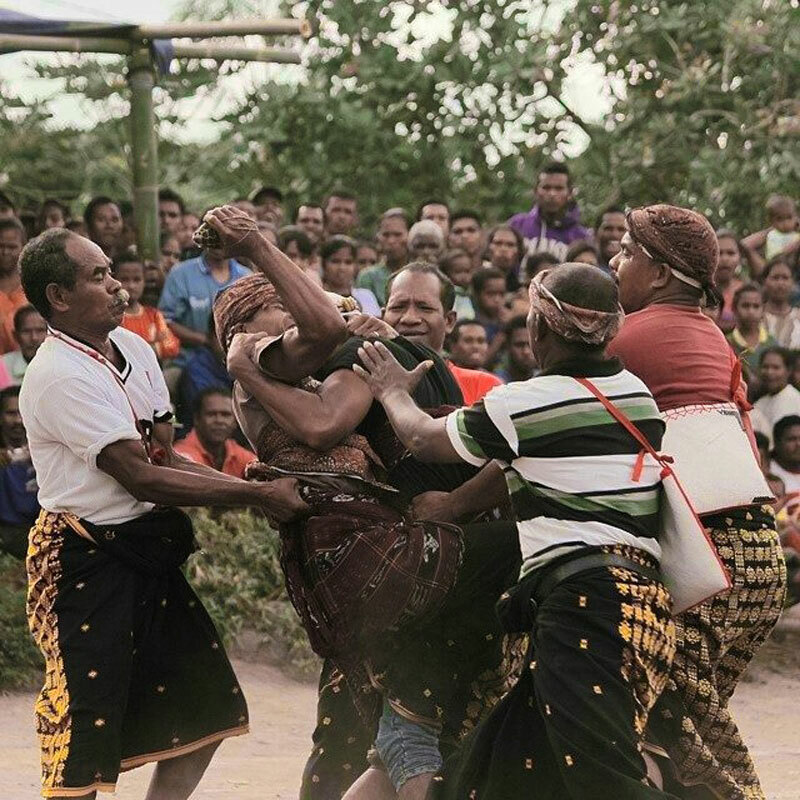 During the dance, fighters wear a woven cloth called Songket, while their chest remains uncovered. The fighter who is first hit in the face or on the head loses the game. As you may have guessed, the Caci dance can sometimes be quite bloody, but the villagers see it as a sacrifice to the gods and ancestors. Caci is performed during weddings, births and funerals. It’s an important social event and also a way to resolve conflicts between disputing villages. You’ll also have a chance to watch the Caci during the Penti festival from July to November. Take a little trip 100,000 years back into the past. This cave was first excavated in 1965 by Dutch priest Father Theodor Verhoeven. However, it was only in 2003 when the skeletal remains of small humanoids were uncovered a few metres under the ground! Only 106 centimetres tall and weighing around 30 to 40 kg, the skeletons were initially thought to have belonged to children. But when further research showed up, scientists realised that a new human species had been discovered! 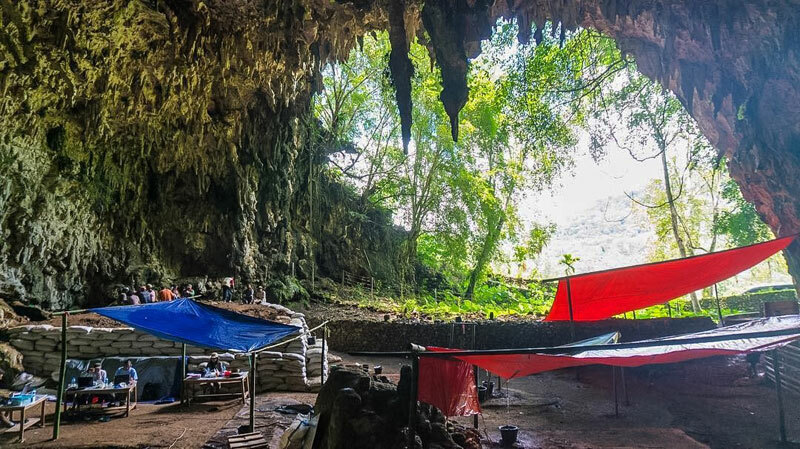 Homo Floresiensis, nicknamed “hobbits”, became extinct around 50,000 years ago (tens of thousands of years earlier than originally thought), which makes them one of the last early human species to die out. 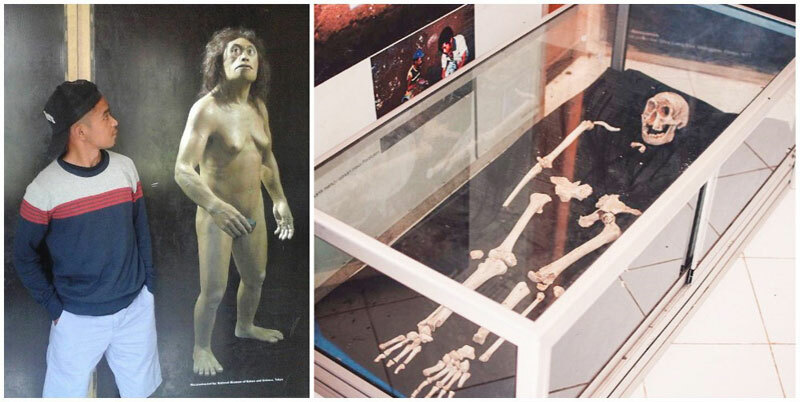 You can see the original skeleton and learn more about the Flores hobbits in the museum, and if you are interested, ask your guide to take you to another village, where you can meet one of the hobbits’ direct descendants! The discovery of the hobbits brought up a series of questions: How exactly did the hobbits come to be? Was it a volcanic eruption that ended their existence or did they cross-breed with another human species? Was their small size a result of isolation on the island or was it just a disease that caused their dwarfism? Excavations and research at Liang Bua are still going on. Hopefully, one day, we’ll understand more about human evolution. But until then, the cave will keep its secret and all we can do is speculate. 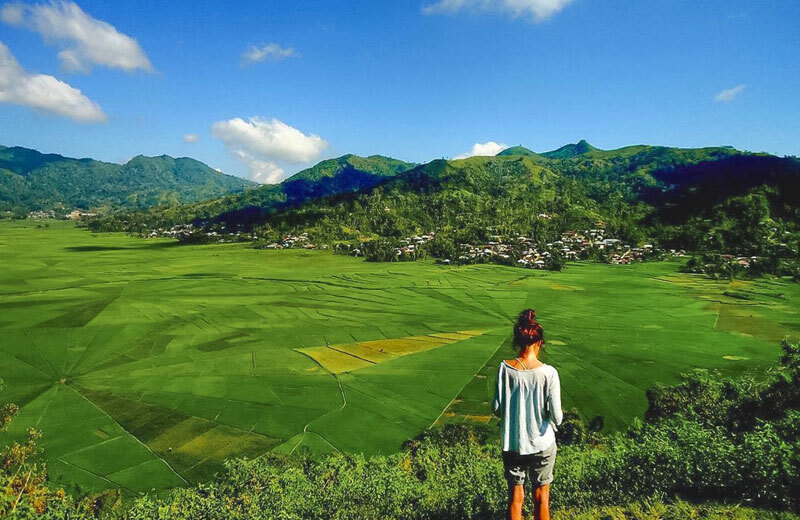 On your way to Ruteng, you can do a little stopover like we did, and spend some time soaking in this beautiful view. 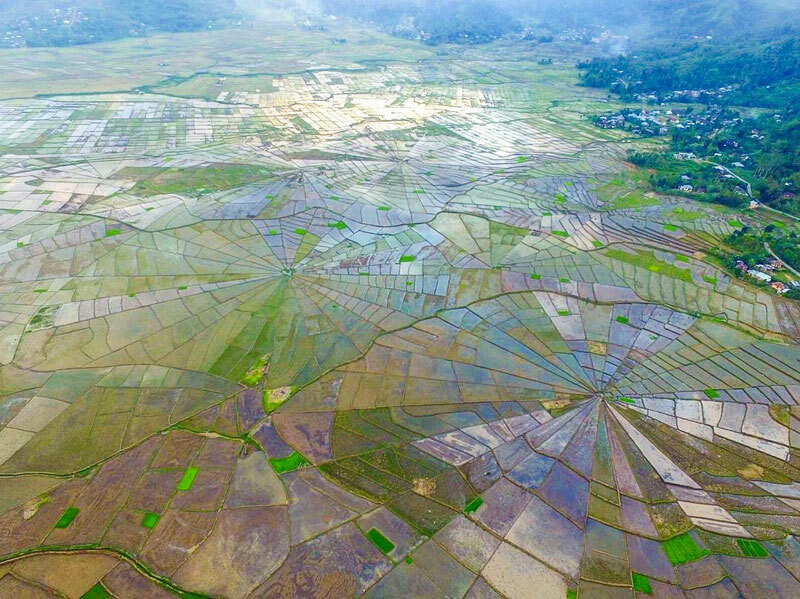 As I stood there, I couldn’t help but wonder why the villagers decided to shape the rice fields this way. The guide explained to us, that it is not just for viewing pleasure. 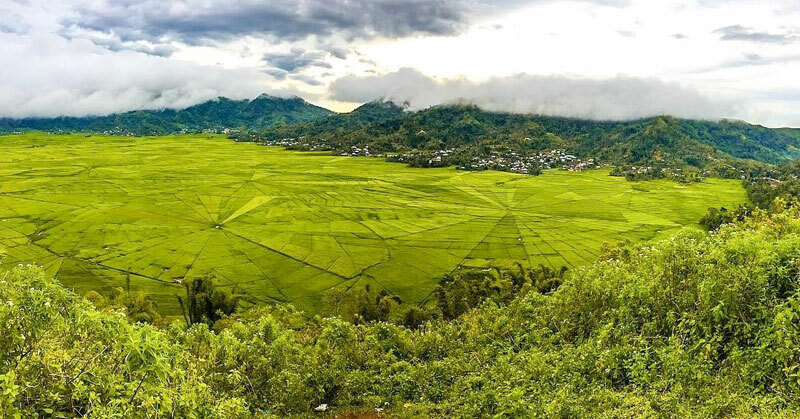 The true reason is that the land is owned by the entire community of people from Manggarai regency, unlike other land in Flores. The individual parts are divided by members of the community according to their status in the village and the number of their family members. The higher the status and the larger the family, the larger the portion of the fields would be given to them. So it actually made sense to mold the fields into a shape that resembles a spider web. To reach the viewpoint, you’ll need to climb a few steps. But it’s an easy climb for a few minutes, and if you’re on a road trip it’s a nice motivating factor to stretch your body and breathe in the fresh air with the gorgeous view in front of you. 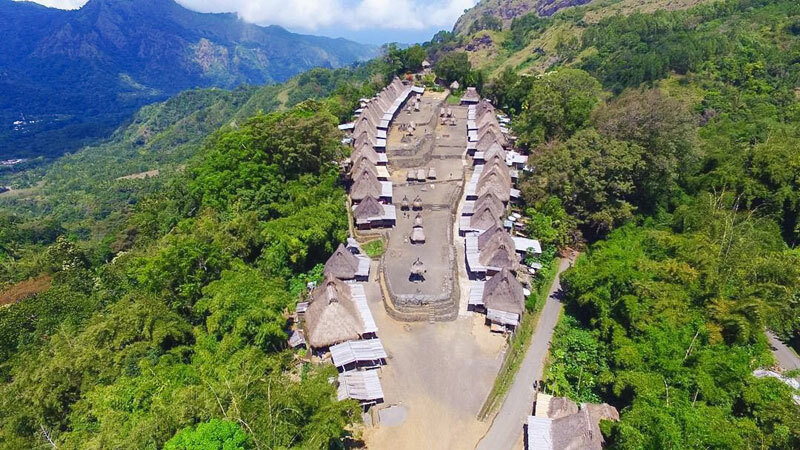 Bena, one of the most visited traditional villages in Flores, a place where centuries-old traditions are kept. The village consists of 45 houses called “bhaga”. 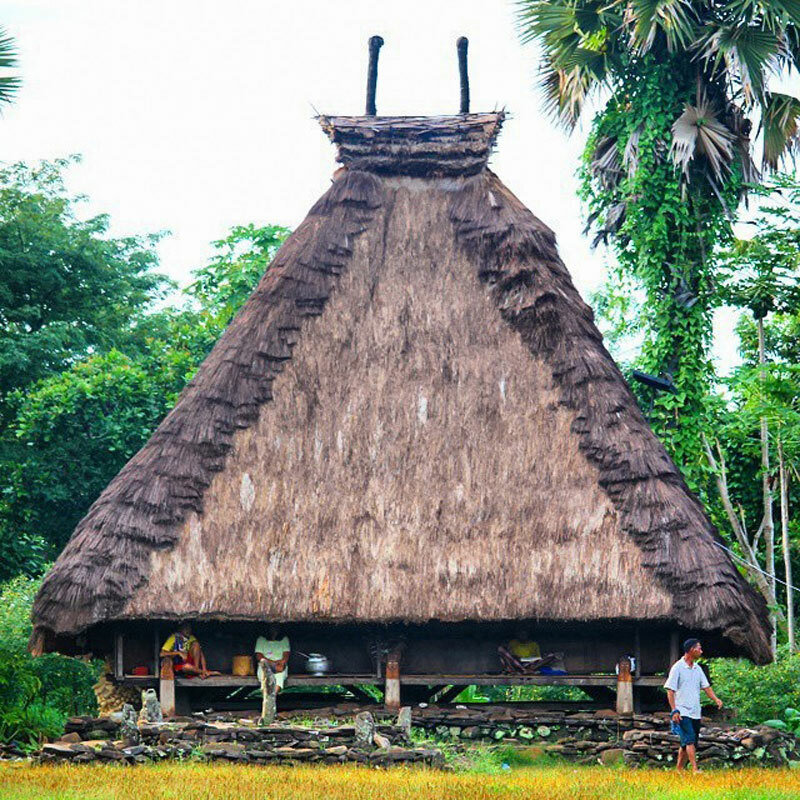 You can see human figurines on the thatched roofs and the doorways are decorated with buffalo skulls. Every time a house is renovated, one more skull would be added. The houses are arranged in two rows and in the space between, there are graves, stone monuments, and in the village centre you will find a sacred sanctuary – Ngadhu and Bhaga. These carved tree trunks represent the natives’ ancestors. Ngadhu, the symbol of fierceness and masculinity, represents the male element, and Bhaga represents the female ancestor. 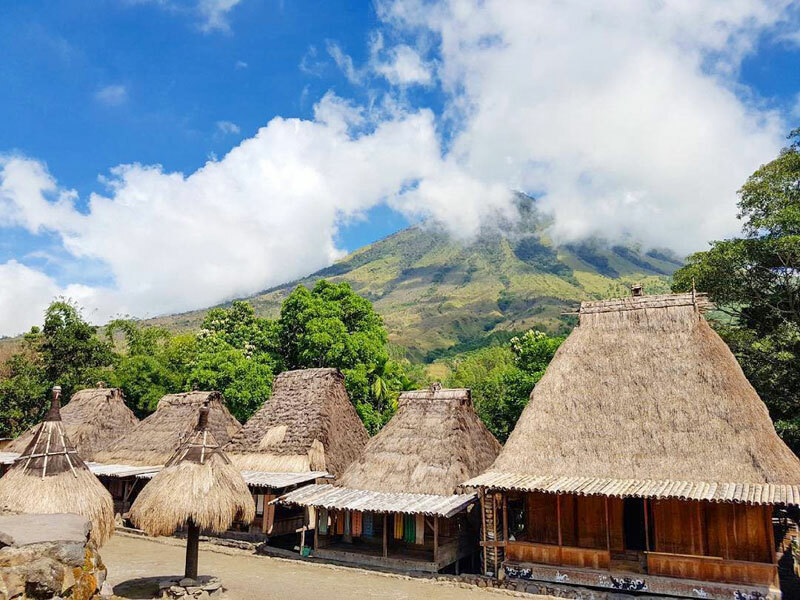 When we reached the end of the village, we were surprised by the stunning view – we could see Mount Inerie and the Savu Sea, with the view of Bena village behind our backs! 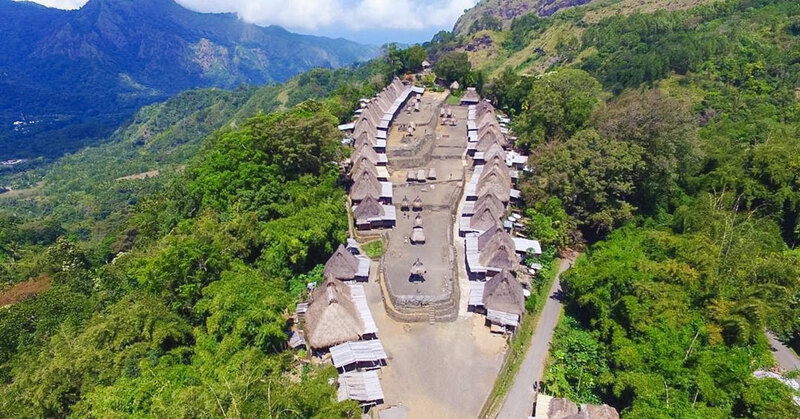 Bena village is home to nine clans living in 45 houses and even though modern technology has invaded the land (there’s televisions and mobile phones), the villagers are still trying to maintain their 1,200-year-old traditions. 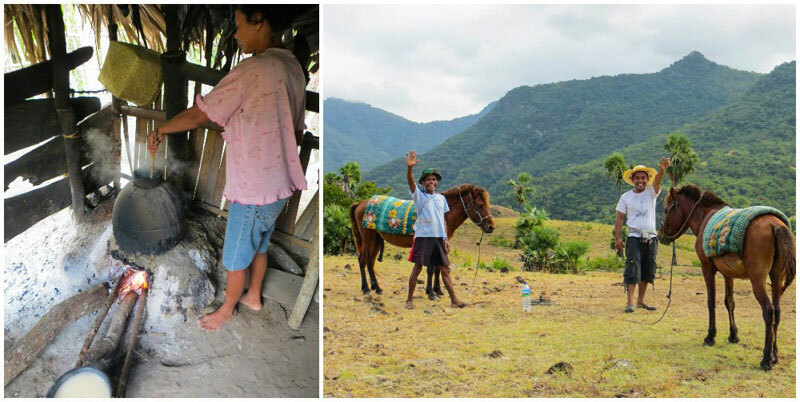 You can watch them in their everyday life – farming, making traditional ikat (tube sarong, which you can buy from them), chewing betelnut (which is the reason why some of them have bloody teeth), and kids playing outside. Bena people are very friendly and even though they have their own language, Ngada, most of them understand Bahasa Indonesia. So if you can speak a bit of the latter, they will be able to chat with you, or even invite you into the house for a cup of coffee brewed from homegrown beans. Most of the citizens converted to Catholicism, but others still worship ancestors and practise rituals such as animal sacrifice. 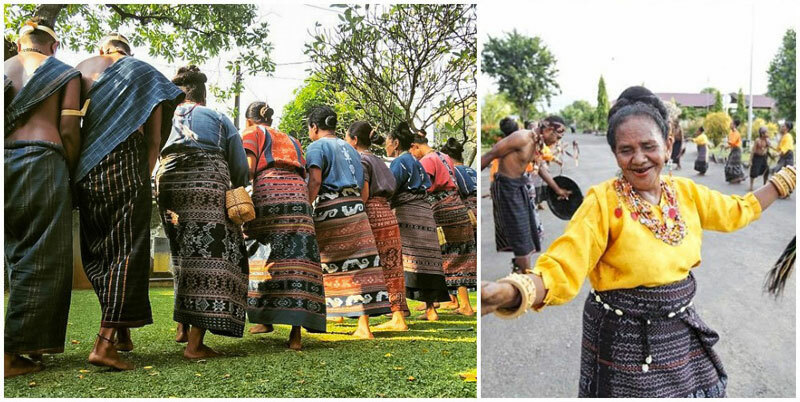 The best time to visit is the end of December, during the week-long Reba festival, where the villagers gives thanks to God for the year’s good harvest by singing and dancing in traditional ikats. Address: Nusa Tenggara Tim., Tiworiwu, Jerebuu, Kabupaten Ngada, Nusa Tenggara Tim. 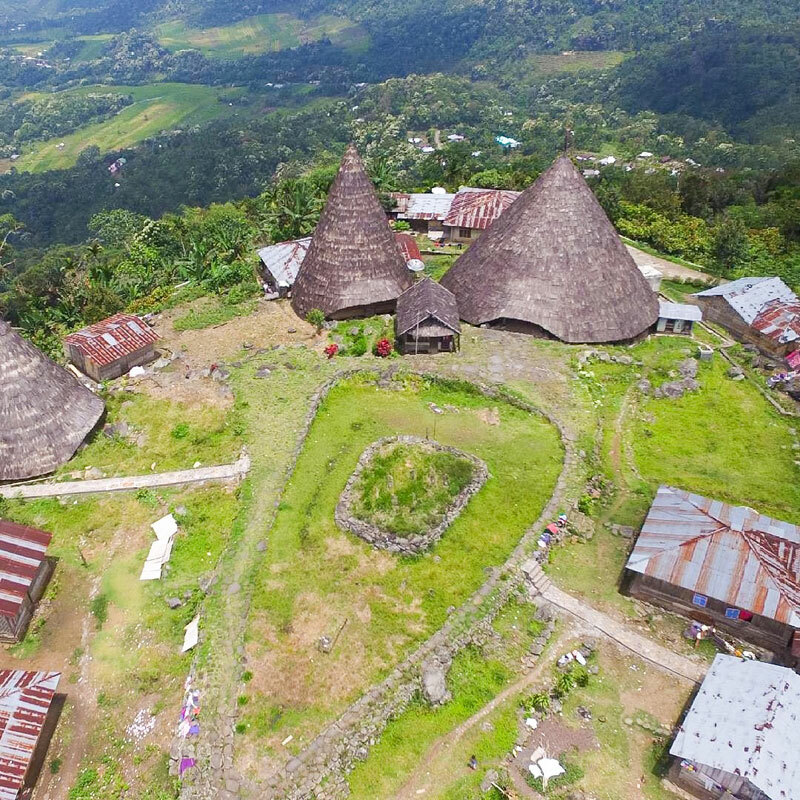 Wae Rebo is one of West Flores, Manggarai’s oldest traditional villages, most well-known for its exquisite cone-shaped housing. 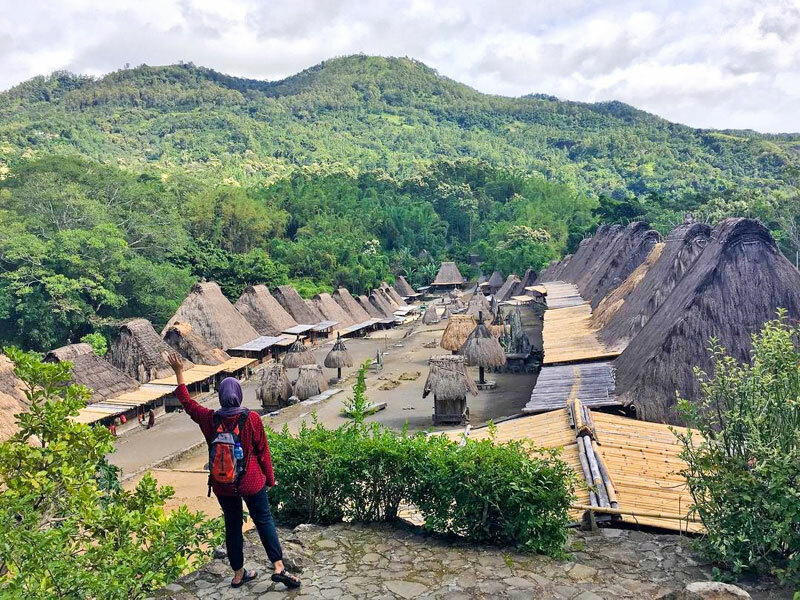 The village is located on an idyllic mountain, and requires a some stamina to arrive at – don’t scoff at a five-hour hike. 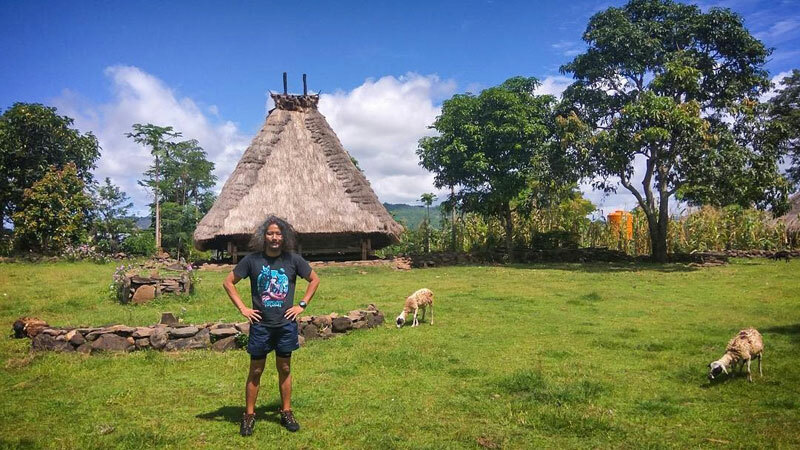 But once you’re there, you’ll get to interact with the indigenous Wae Rebo people, and even stay overnight in one of the traditional thatched houses! 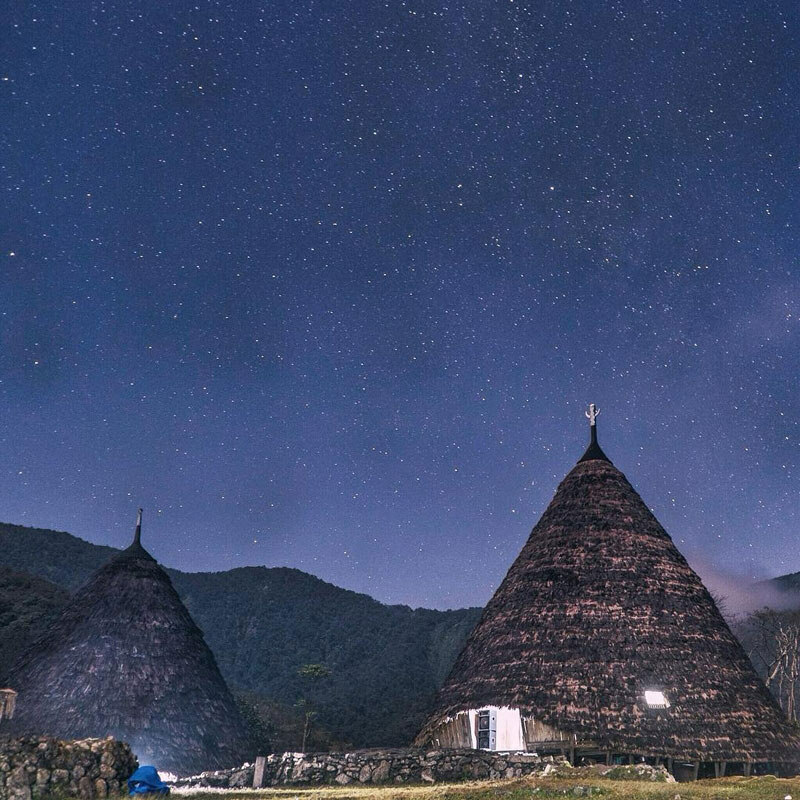 Arriving during the Penti Festival (the Wae Rebo people’s New Year’s Eve) in November will give you a special chance to understand more about this ancient culture. And after you spent 5 hours hiking up a hill and panting your way to the village – surely you’re not just going to catch a good night’s sleep and leave, right? Especially not when you’re at a great vantage point; perfect for some late night stargazing. Asoka himself testifies to the unearthly beauty of the Milky Way as seen from the hilltop, and we agree. We don’t think there could be any dream that could unseat this view from its throne of beauty. Just sacrifice a few hours of your sleep. You won’t have any complaints (at least until the next day), trust us. How to go: From Labuan Bajo, take a car/motorbike/truck to Ruteng, then Denge, where you have to start your hike up the mountain. The trip from Labuan Bajo to Denge typically takes 7 – 8 hours, while the hike would take another 3 – 6 hours. 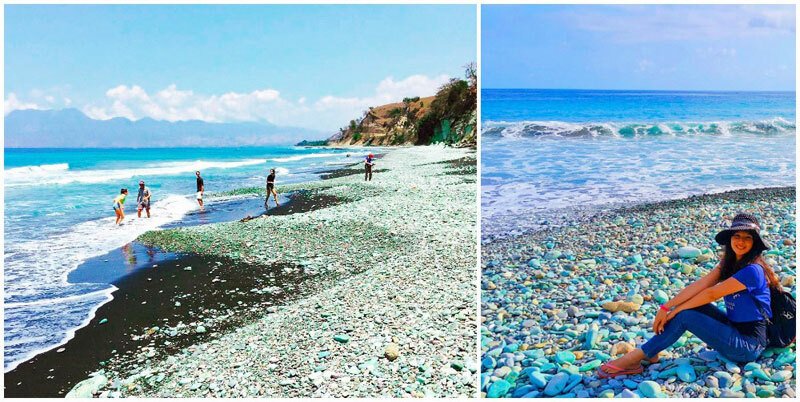 You may have seen a black sand beach or pink beach, but what about a beach with different shades of blue? 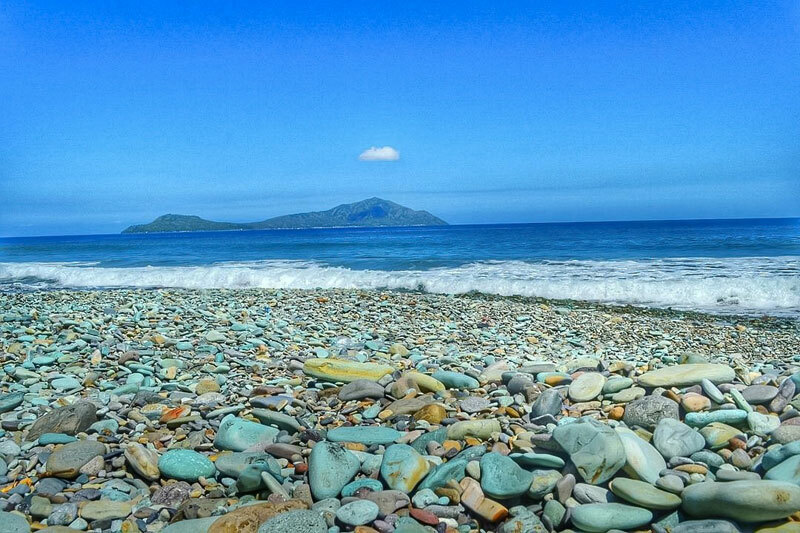 The turquoise pebbles of Blue Stone beach create a splendid mosaic, and together with the green misty mountains of Bajawa in the background, it’s an astonishing sight! Ranging from blue, green to red, the pebbles received their unique colours thanks to the similar-coloured cliffs that they originated from. 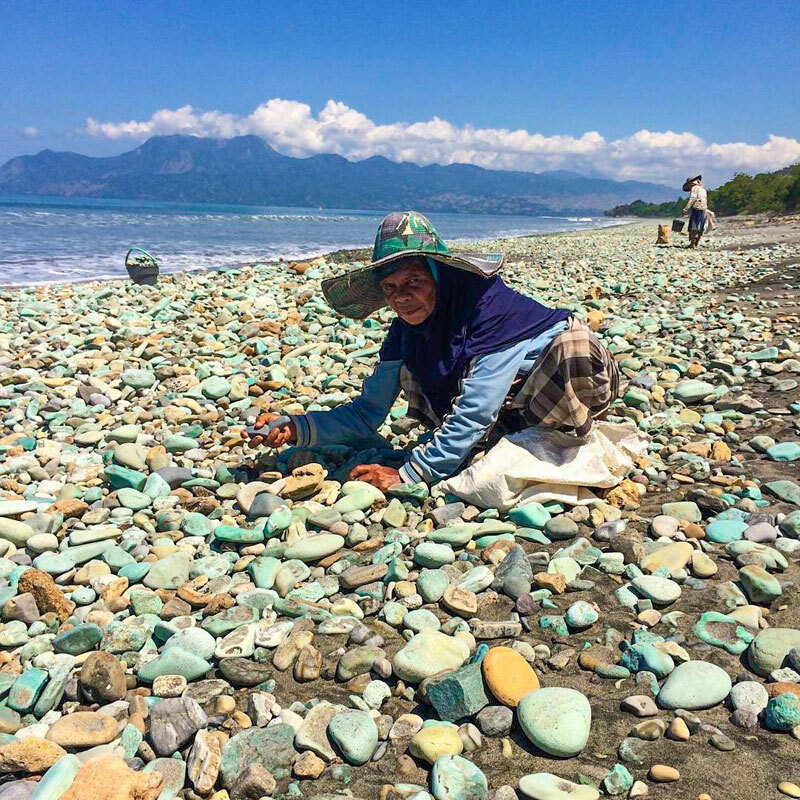 These colourful stones are a good source of income for the locals. They often collect them, sort them by size and colour to sell afterwards. The pebbles can be used for jewellery or any other decoration. 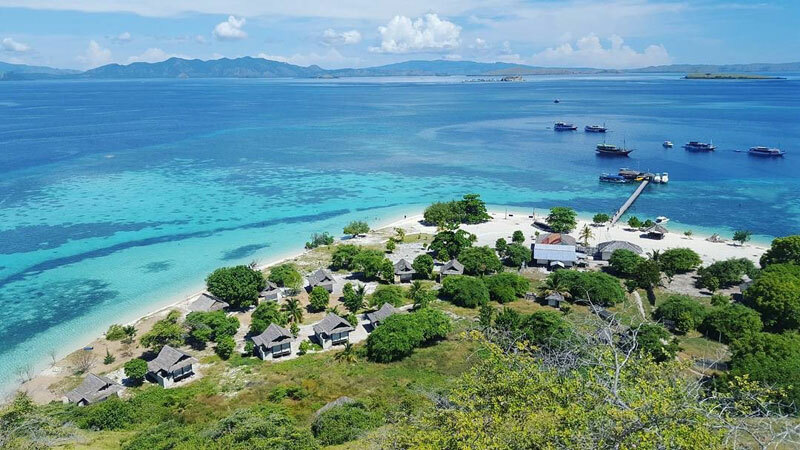 Getting there: The beach is located 25 kilometres northwest of Ende, on the road to Bajawa. The drive takes about 30 to 40 minutes. 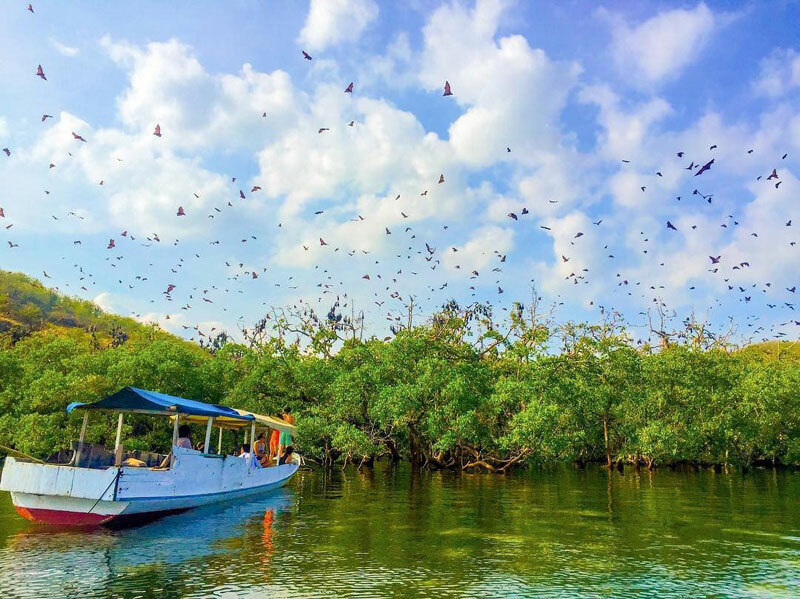 The mangrove forests in Kalong island are inhabited by thousands of bats. When the sun goes down, it’s waking time for the bats, and you can see hundreds of them flying out from the forests in a synchronised flight, their dark silhouettes casting a dramatic shadow in the orange glow. 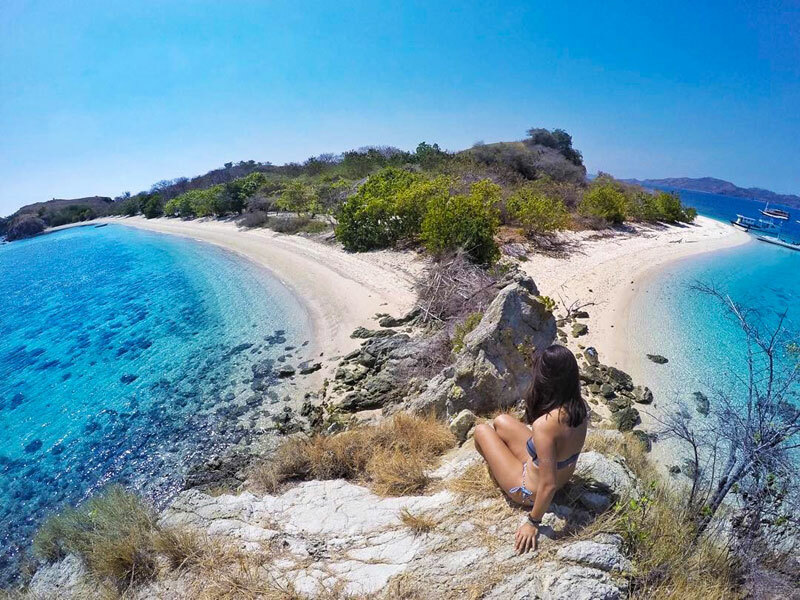 Getting there: Kalong Island is located 8 km from Labuan Bajo port, and the boat ride takes about 1 hour. 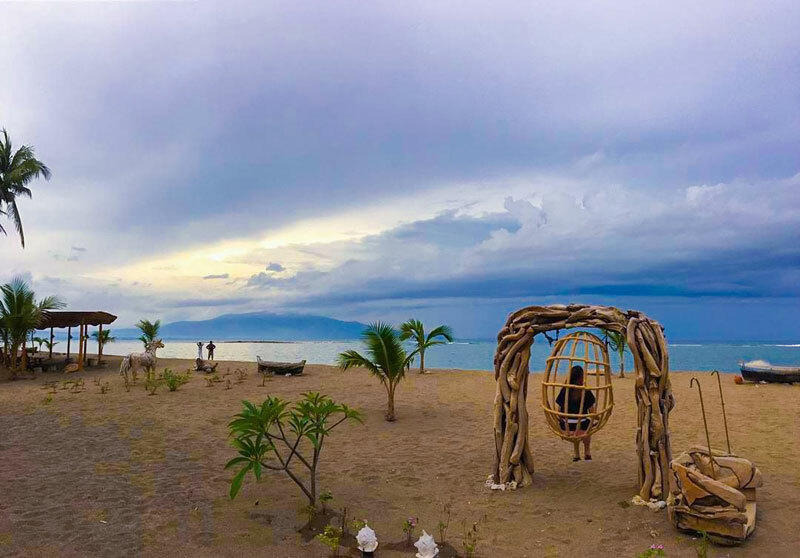 If you are searching for a place with European influences, you would find it in the little village of Larantuka. 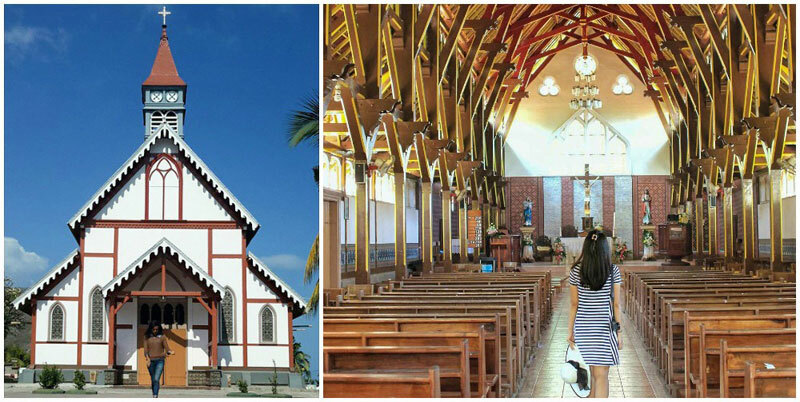 The Portuguese settled there in the 15th century and it is often called ”the place where Catholicism flourishes”. 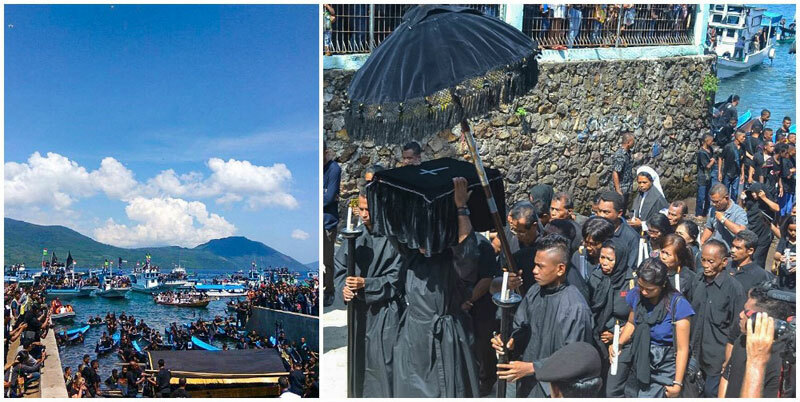 During the week before Easter, quiet Larantuka transforms into a lively and busy village full of pilgrims. That’s when the Semana Santa Holy week celebrations begin! 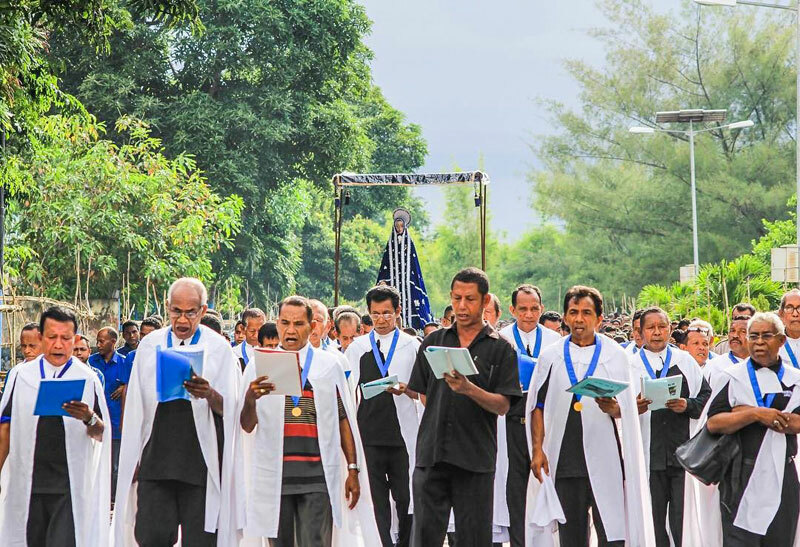 It all starts with Rabu Trewa (Shackled Wednesday), when Larantuka turns into the Town of Mourning, as people pray in the chapels and remember Jesus’ betrayal by Judas Iscariot. 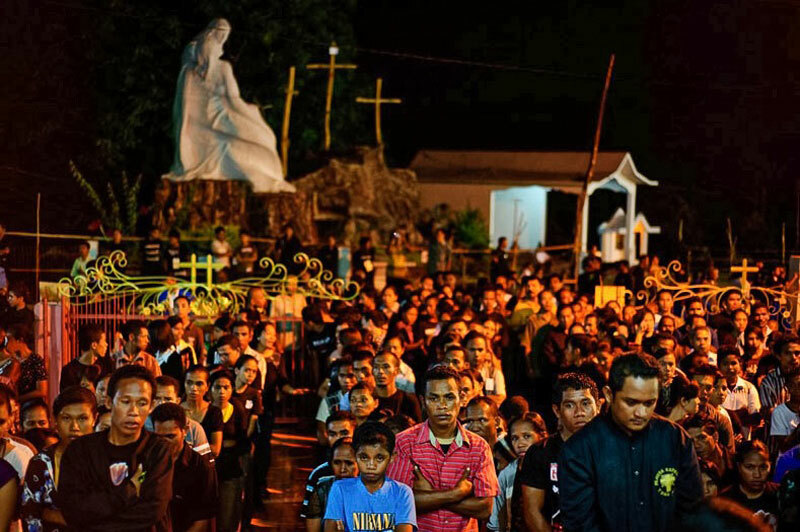 The climax of the celebrations is the Good Friday procession, a 7-kilometre long walk, when a coffin of Christ is being carried from one altar to another through the streets lined with candles. The statues of Jesus Christ and Virgin Mary are also presented to the public on this special occasion. 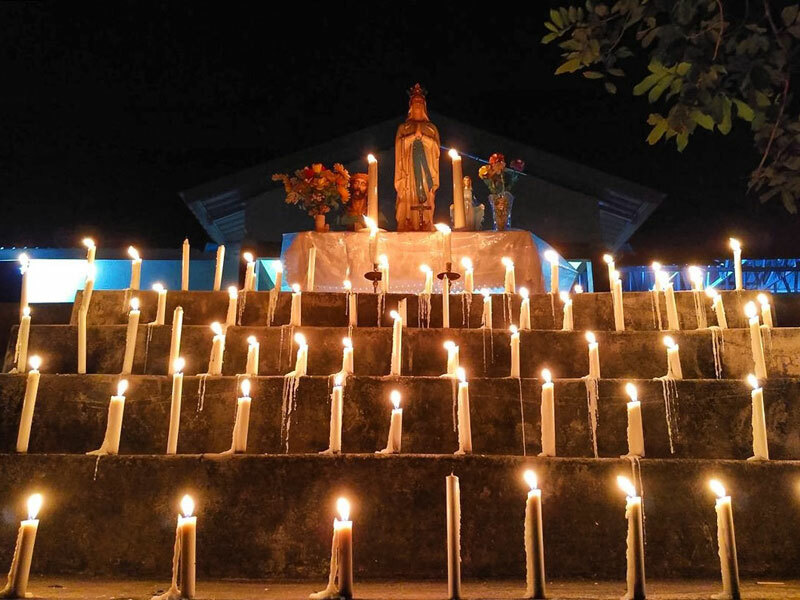 Another celebration that takes place during the Holy week is the Mama Muji – a woman’s celebration. 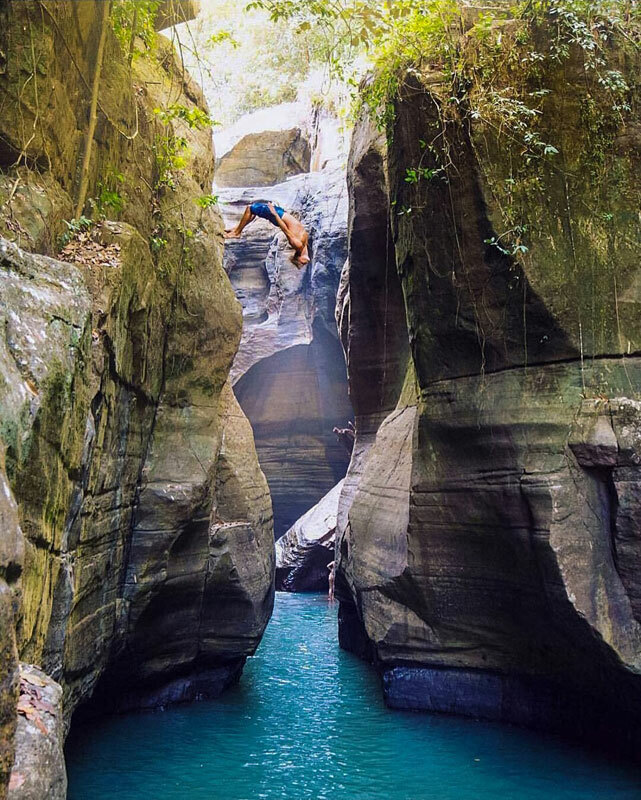 Have you always dreamed of stepping into Jurassic Park? 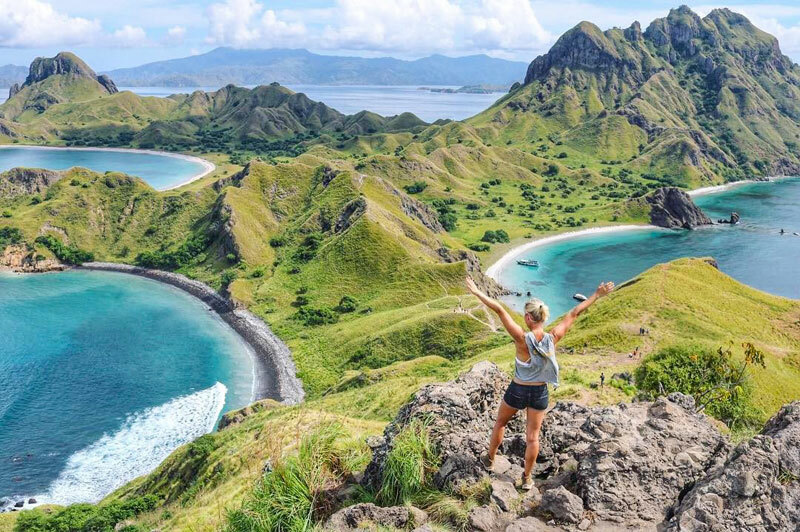 Now – you have your chance at the Komodo National Park, where you can meet live roaming giant lizards, descendents of these extinct monstrous creatures. 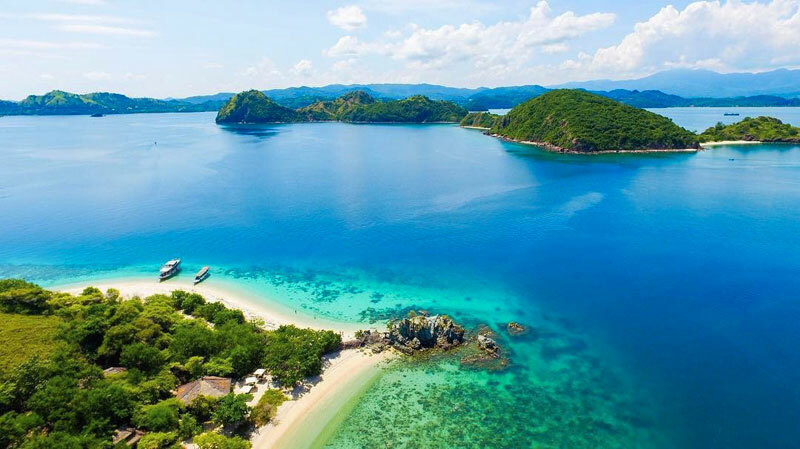 And this is usually the main draw for travellers to visit Flores. 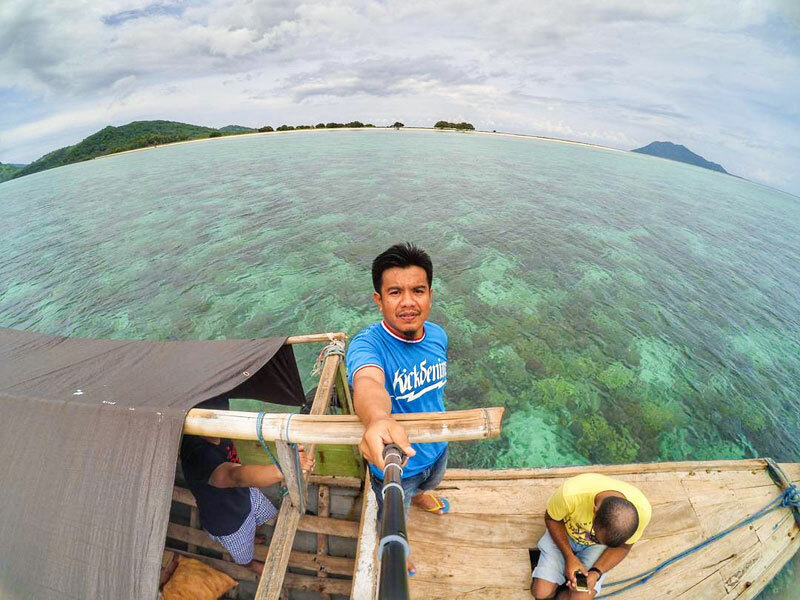 We went on a boat tour from Labuan Bajo to explore this national park (the recommended method). Our first stop was Padar Island, which has a surreal photogenic viewpoint. 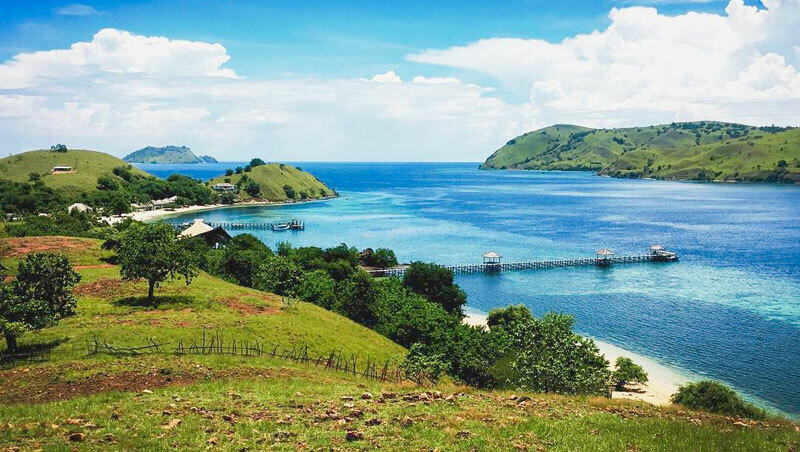 When the boat arrives at Komodo island itself, get ready to meet the dinosaurs! 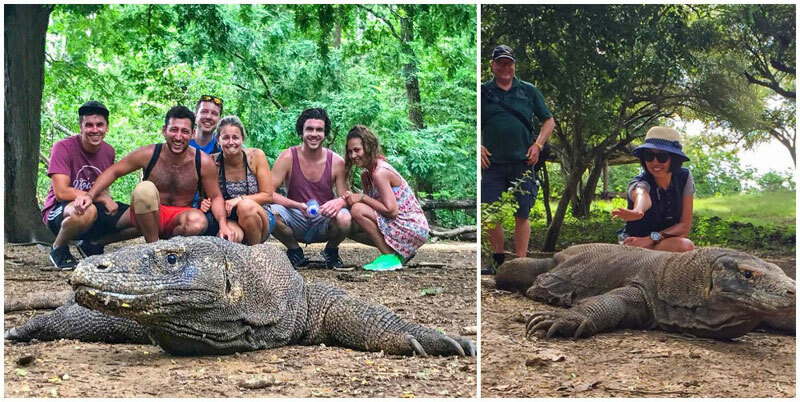 Your guide will take you to locations where you can spot these giant lizards. With a bit of luck, you can spot them sunbathing, drinking from the spring or simply just crawling about. We were quite lucky that day and saw three of them. 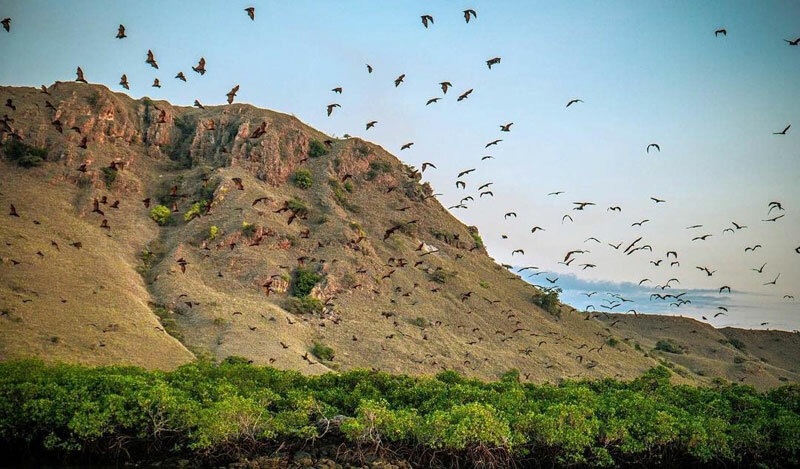 You’ll also stop by Rinca, a smaller island with more dragons, but according to our guide, you should be able to spot them more easily on Komodo island. 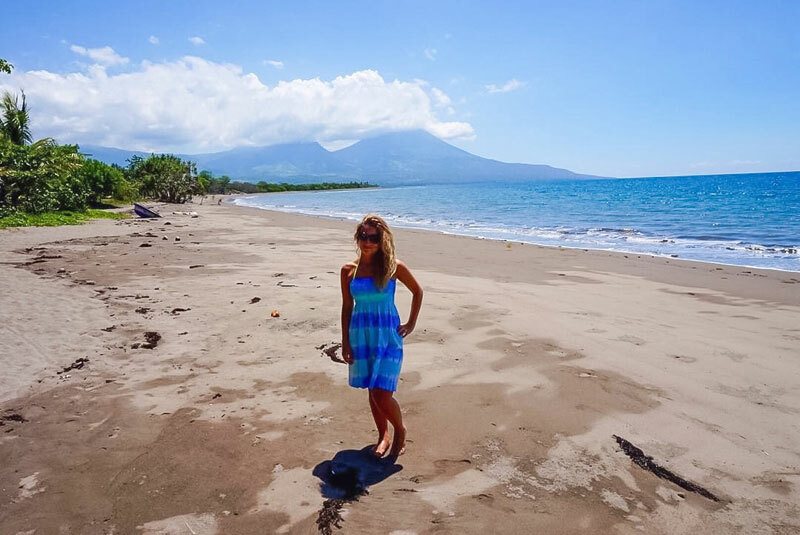 Full day trips usually include a short stop at the pink beach where you can snorkel and get some rest. 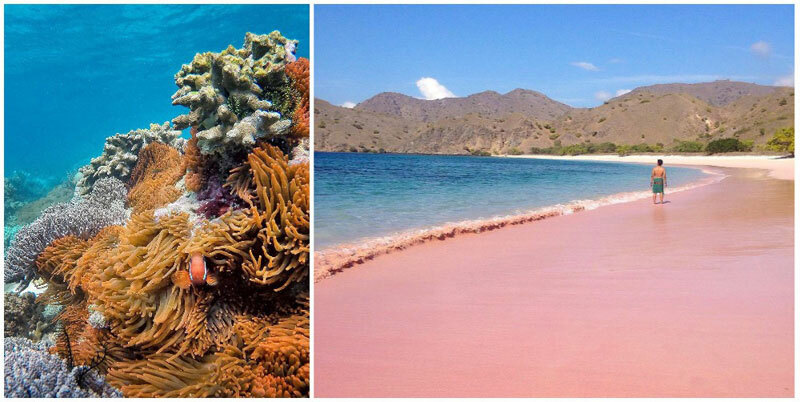 The pinkish shade is caused by little pieces of red coral that mixes with the white sand. 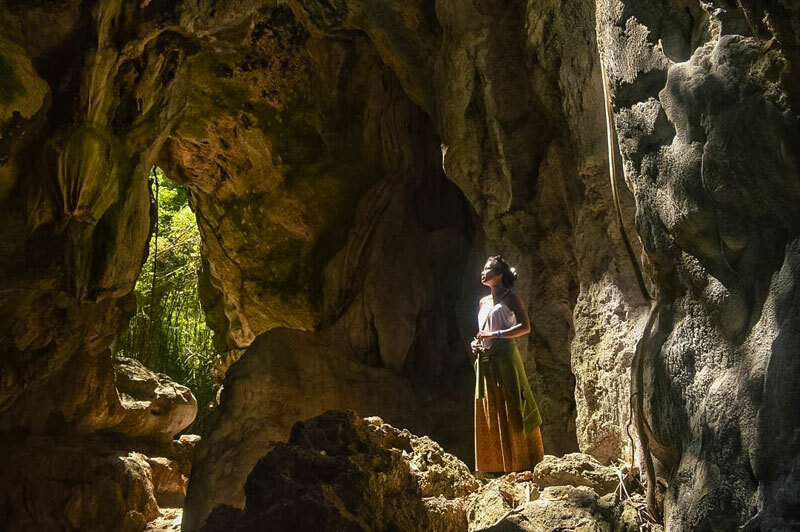 Discovered in 1951 by the Dutch archeologist, Theodore Verhoven, the Batu Cermin Cave is nicknamed “Mirror Cave“ due to a magical phenomenon – as sunlight passes through the cave, the light is reflected from one stone wall to another, which creates a mirror effect! This is because the stone contains bits of salt, which reflect the light like a mirror. The stone covers an area of 19 hectares and the cave is about 75 metres high and 200 metres long. To see the sparkling stone, you’ll have to go down to a depth of 20 metres. During the rainy season, it’s even possible to see the reflection of water puddles on the cave walls! 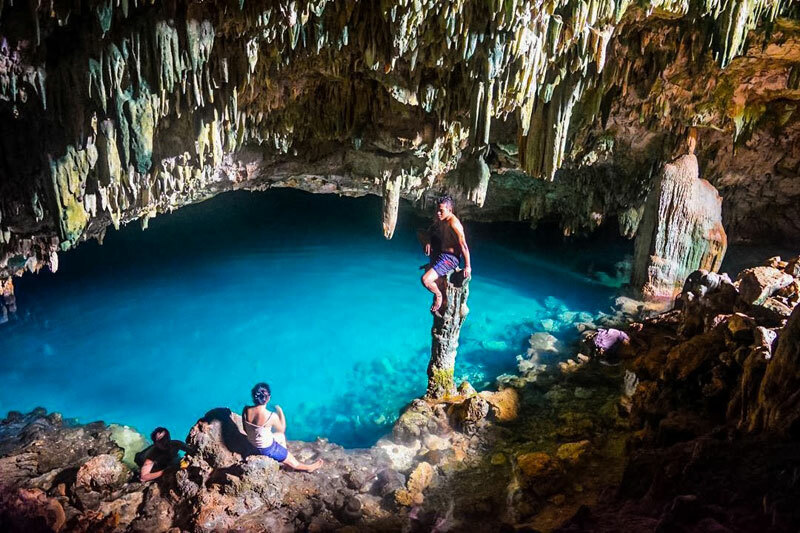 The cave is also covered with sparkling stalactites and stalagmites, and as it has once been submerged in the ocean, you can find fossil corals and turtles in the cave walls too! You can’t leave Flores without a handmade traditional ikat! 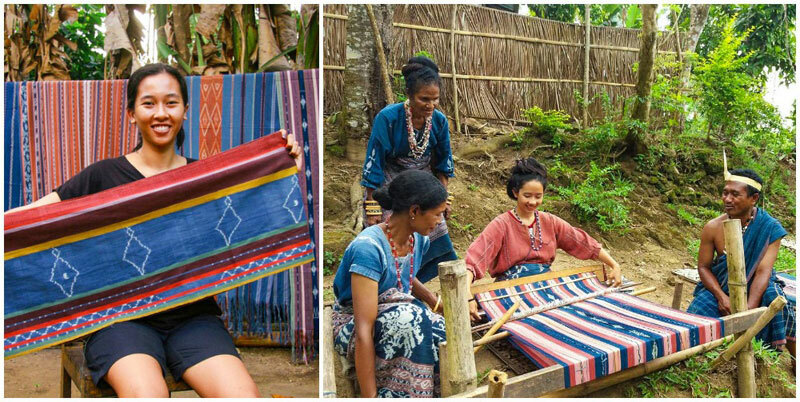 In many villages, the ikat is still made in an old, traditional way, using only natural resources. Some are made into a tube dress! Many people collect it for its beautiful colours and patterns. 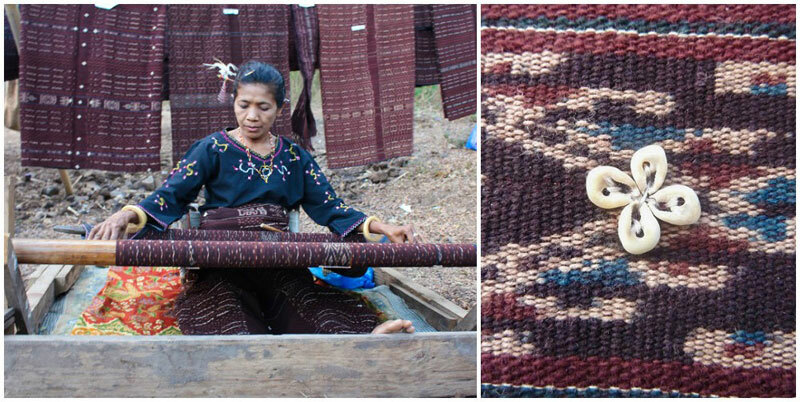 And by buying ikat, you’re not just getting an organic handmade souvenir, but supporting the local community too! 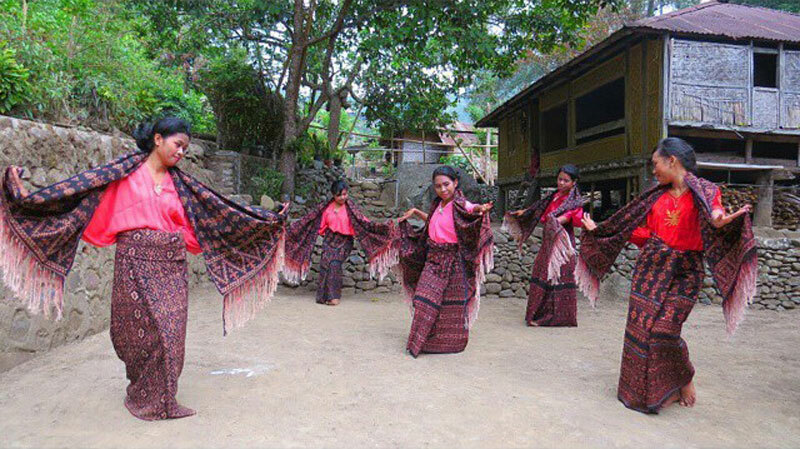 Unlike many other communities, Watublapi village stayed faithful to the old traditional methods. To create ikats, they use handspun yarn made of local cotton and natural dyes from the plants grown in their garden. 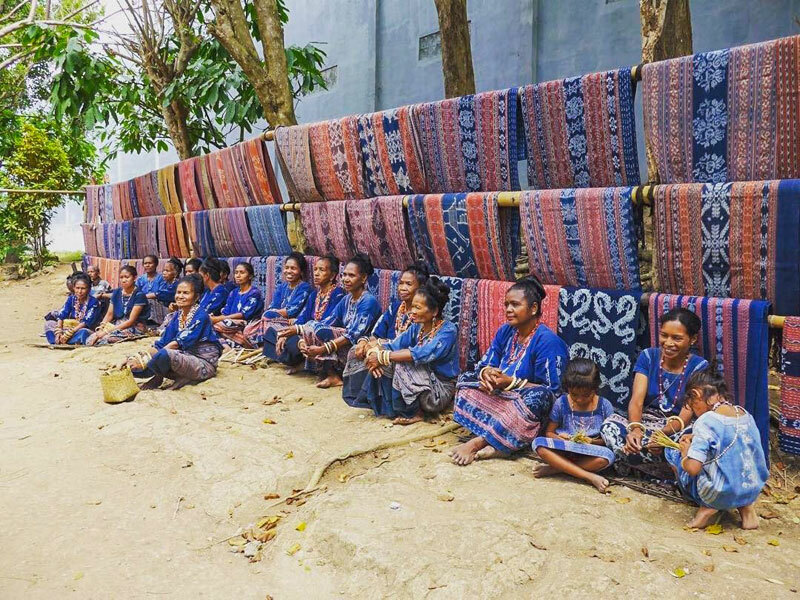 Locals will show you each step of the ikat weaving process, and if you want to learn to make it yourself, you can join a workshop too! 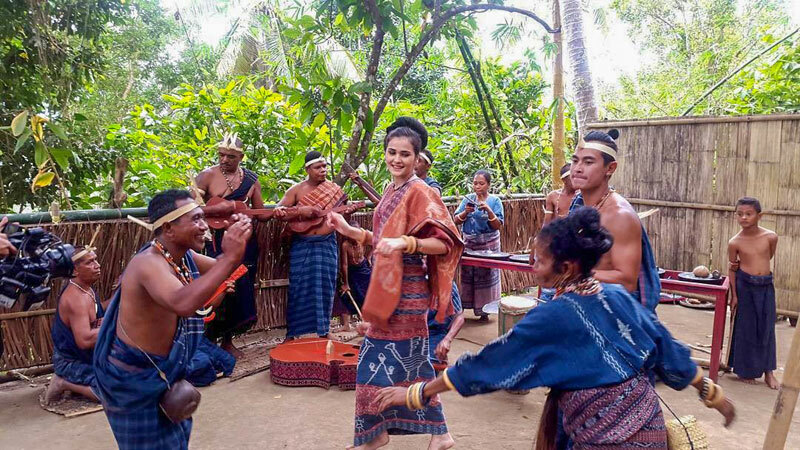 To get the best experience, register in advance and you will be welcomed by a traditional dance and music performance or even a betelnut chew! 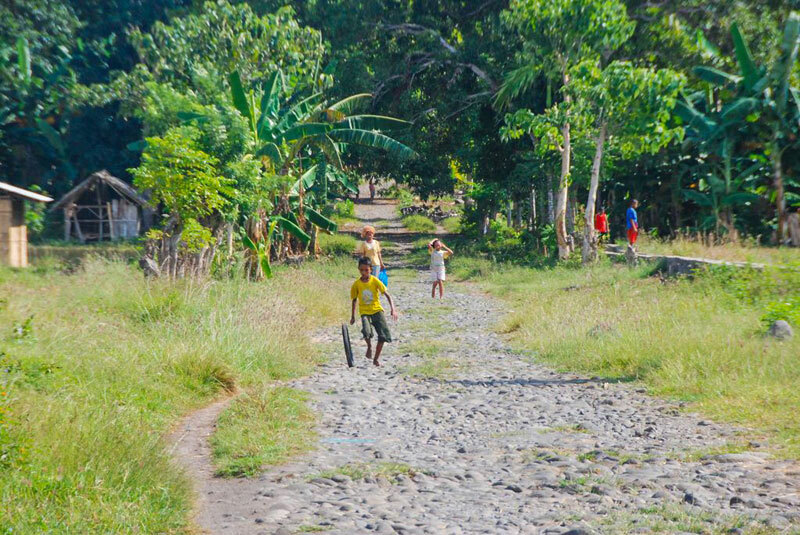 Getting there: Watublapi Village is located east of Maumere. You can get there by car or motorbike. About 7km from Maumere, pass Geliting Market. And 100m from the market on the right, there is a sign to St Gabriel Hospital. 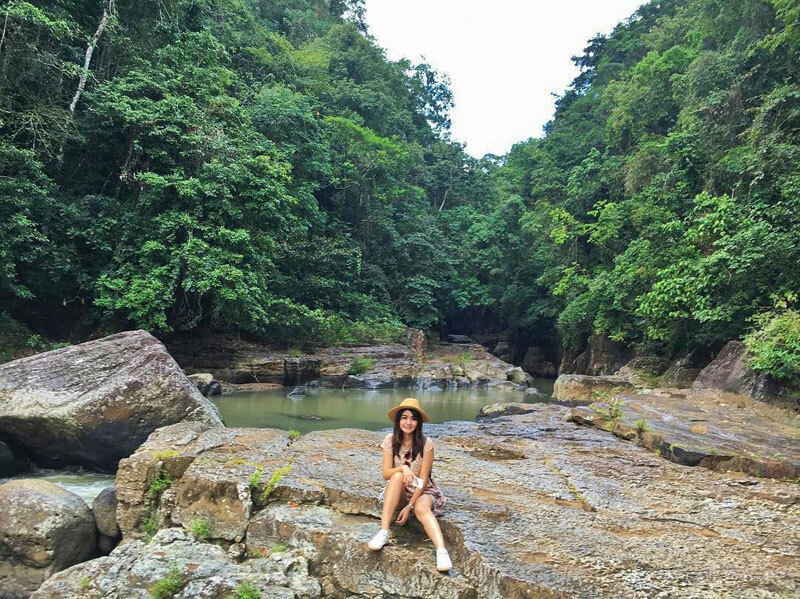 Follow the road and after 13km, you will arrive in Watublapi, with its bamboo entrance gate on the left. The Ndona community of Bou Sama Sama, led by Ibu Maria Angelina, creates beautiful naturally dyed ikats, especially the red ones, which are dyed using extracts from the morinda tree. Getting there: Ndona village is only around 5km (around 20 minutes) from Ende. It is recommended to get there by private transport as there is no public transport available. 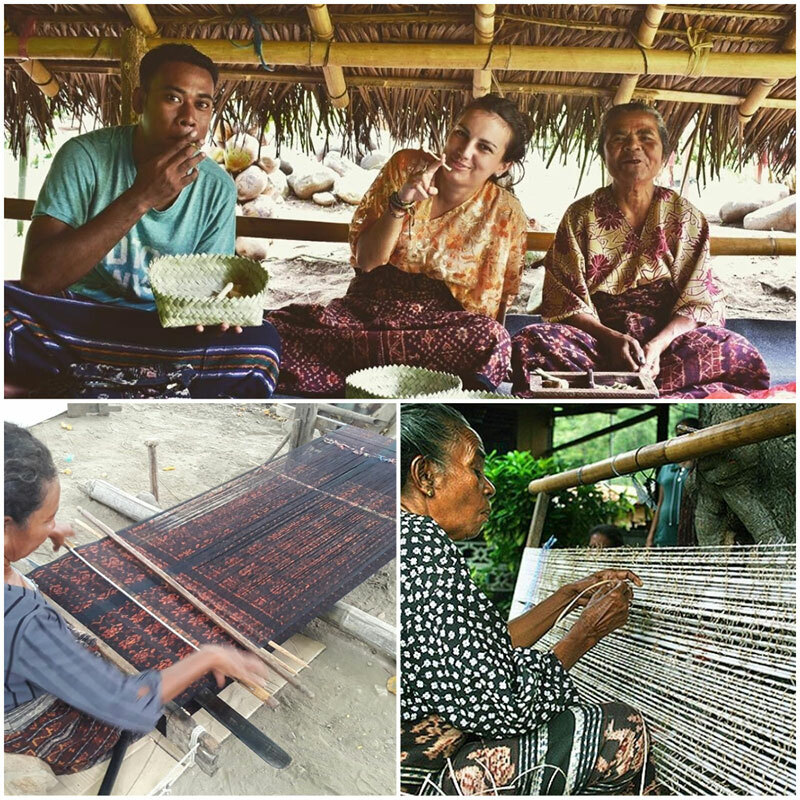 Sikka Village is one of the most important weaving centres in Flores. It is the only place where you can see the blend of traditional art with Catholicism brought in by the Portuguese. Even the walls inside the church of Sikka are decorated with ikat motifs! During Christmas, you can watch the dramatic Toja Bobu dance, also influenced by the Portuguese. 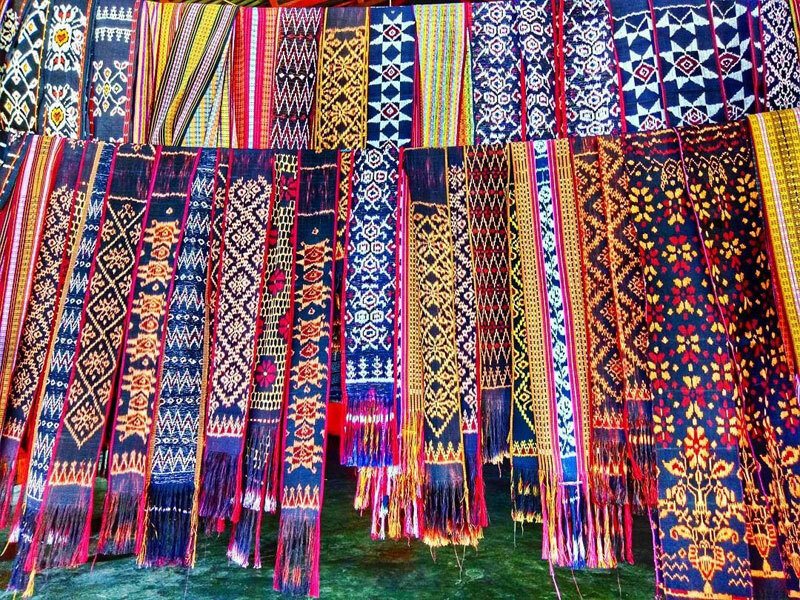 All ikat collectors must have the unique ones from Lewokluok village – the ikats are decorated with seashells that villagers collect from the shores! Getting there: There’s no public transport that passes through Lewokluok. 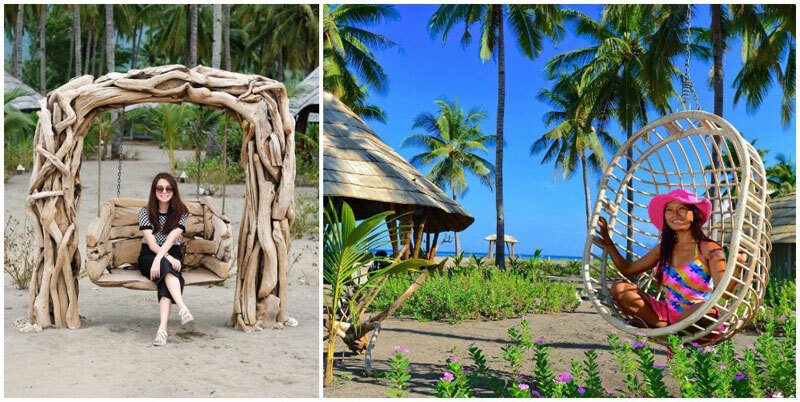 By car or motorbike, you need to drive for about 26km from Larantuka and 114km from Maumere. The road off the Trans-Flores highway that leads you to Lewokluok is another 2km. 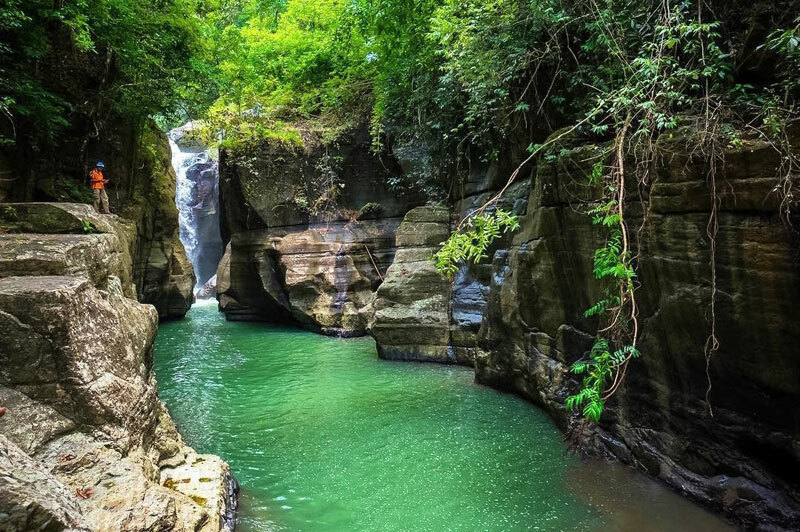 With such beautiful landscape in Flores, how can you not check out the flowing waterfalls? Situated in a tropical rainforest, Cunca Wulang is often searched for by canoeing enthusiasts. You can hike here and swim in the natural pools! 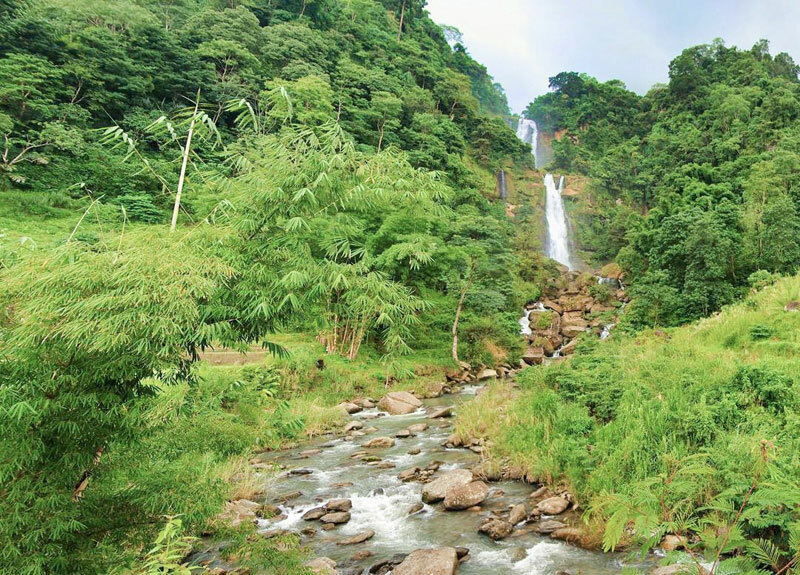 On the way to Tengkulese waterfall, you will walk through landscapes with lush green hills and paddy fields. And before you know it, this huge 100-metre-high waterfall would appear in front of you. We don’t recommend jumping directly into the water, as the currents can be very strong. 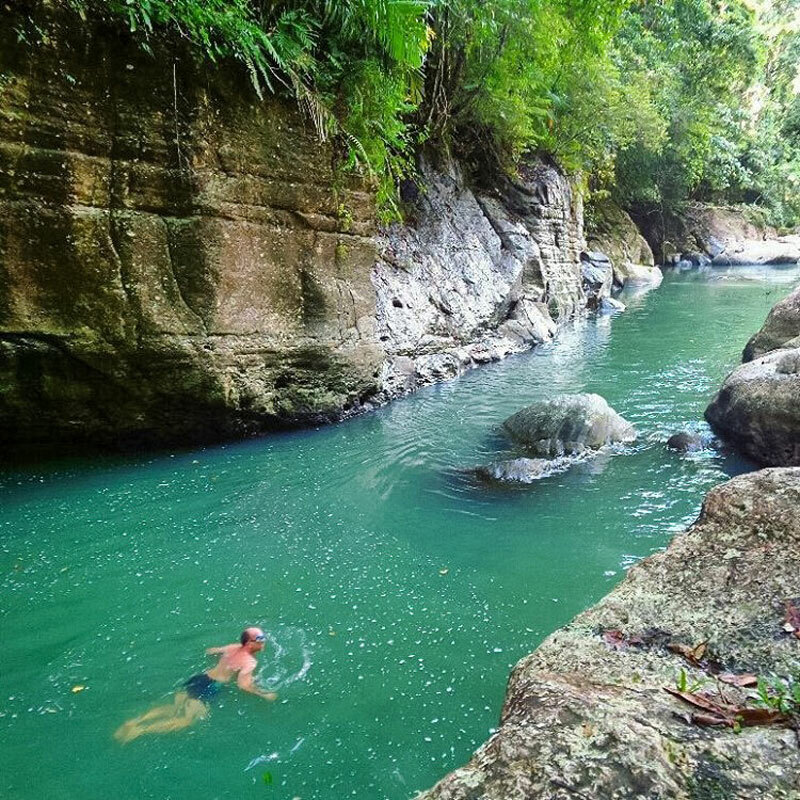 A safer alternative would be to follow the stream, and you’ll find smaller natural pools where you can have a dip in! Getting there: From Ruteng, it is about a two-hour drive to reach the starting point of the hike. 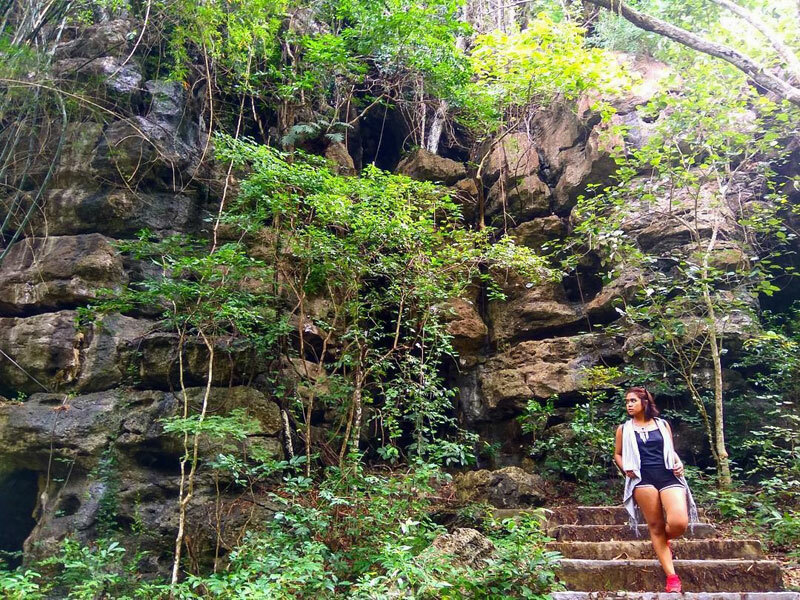 There are a number of routes that lead to Tengkulese waterfall, but the shortest recommended one is from Liang Bua, which is only 15km away. From Ruteng to Liang Bua, add another 13km. The best option is to go there by a private vehicle (car or motorbike). The access road ends at Nanu Village. From there, you will have to walk for about 2.5km to get to the waterfall. 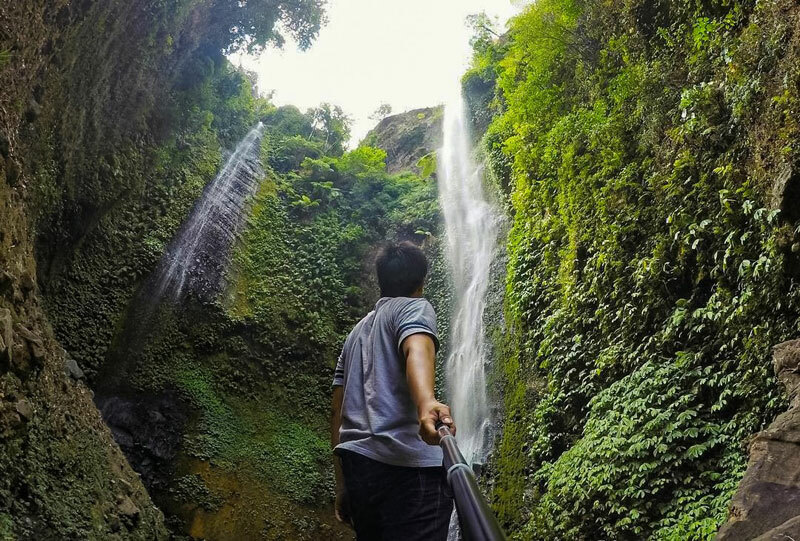 There are three adventurous hiking trails that will get you to Murusobe waterfall, either via the Trans-Flores highway, from Lekebai village or from the Northern Road via Deturia village. 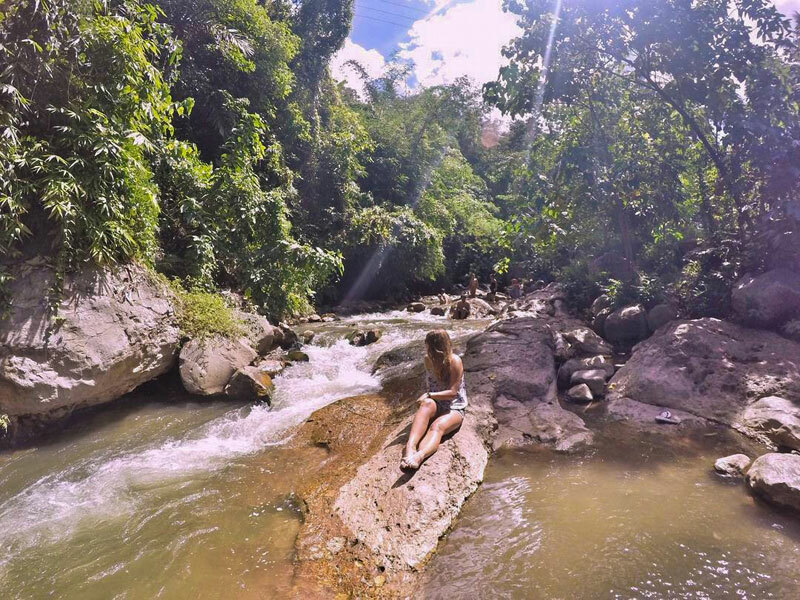 Each of them will lead you through untouched traditional villages, before reaching the immense waterfall. Getting there: Either via Trans-Flores, from Lekebai village or from Deturia village. 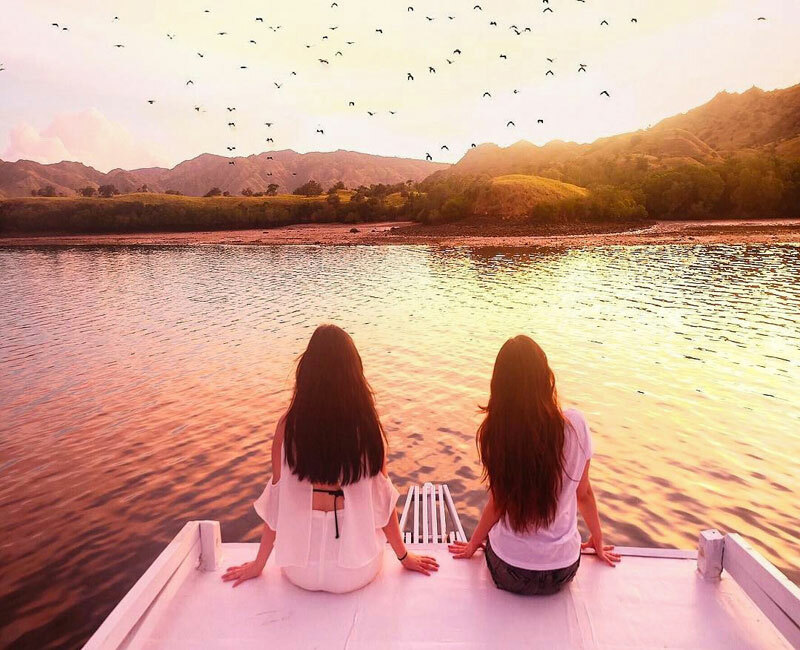 What do you imagine when you think about paradise? Crystal clear water, coconut palm trees, isolated white sand beaches, with deep ocean stretching out into the horizon? 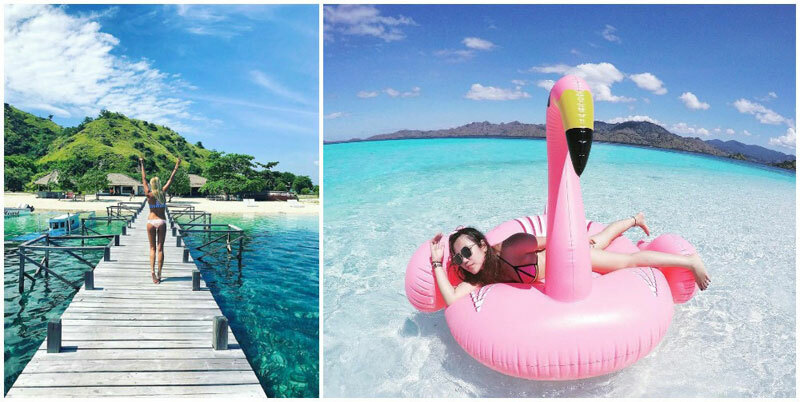 17 islands have it all! 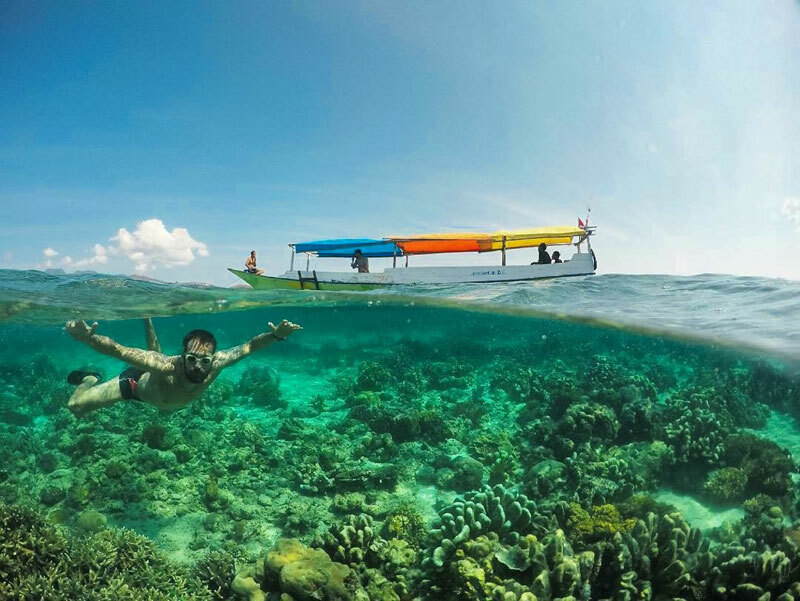 This coral garden national park actually consists of 20 islands, and were said to be named after the day of Independence in Indonesia (17th August). Another legend behind the name is about a 17-year-old Indonesian girl. 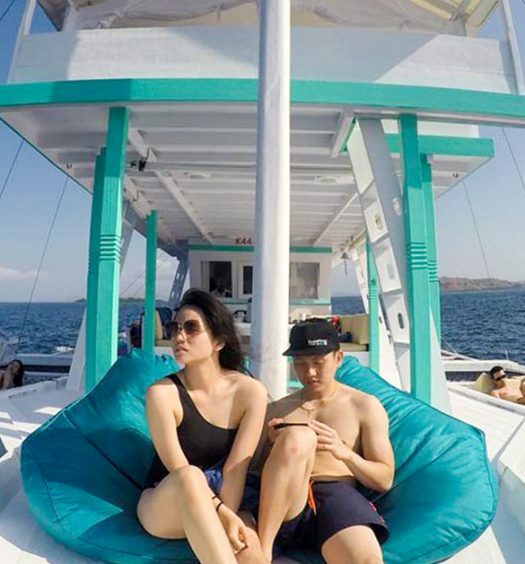 A one-day boat trip is a best method to explore as much as you can. Find your guide in Riung. 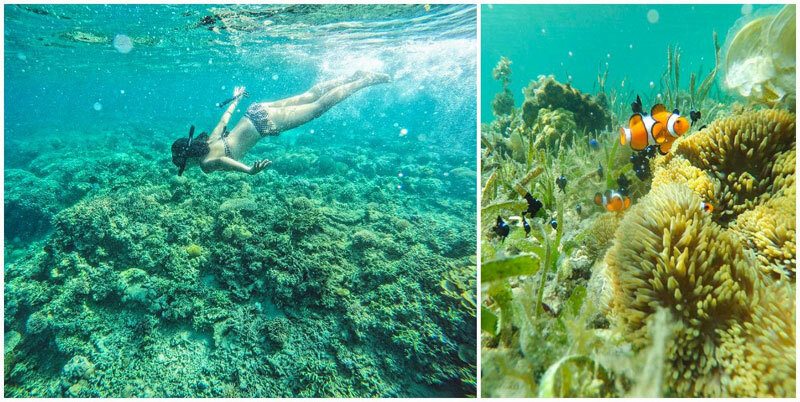 If you have a passion for snorkeling, the best spots are in Pulau Bukit Tiga and near Pulau Mborong. 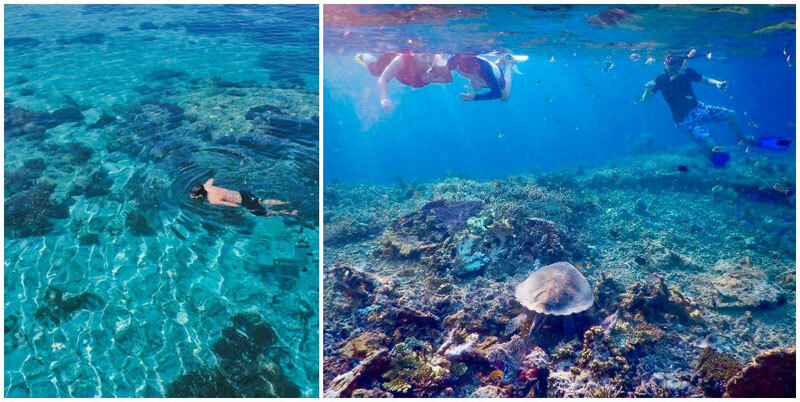 The rich coral-reef ecosystem offers a spectacular view of 27 different coral species, thousands of colourful fish, starfish and turtles. If you are lucky, you may even spot dolphins or whales from your boat. 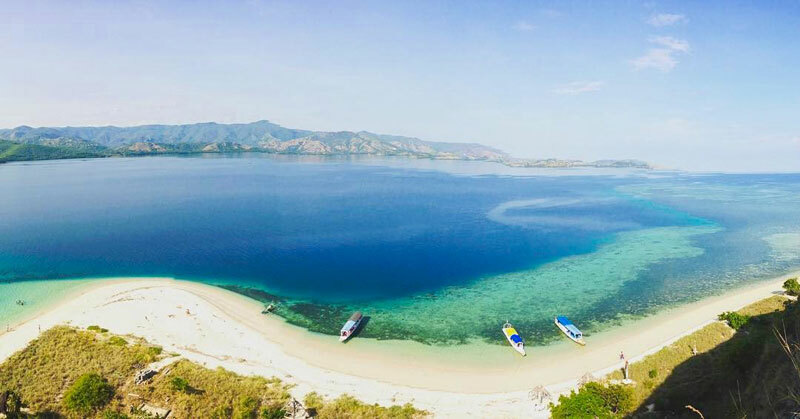 Getting there: Take a boat trip from Riung, located approximately 72km from Bajawa. 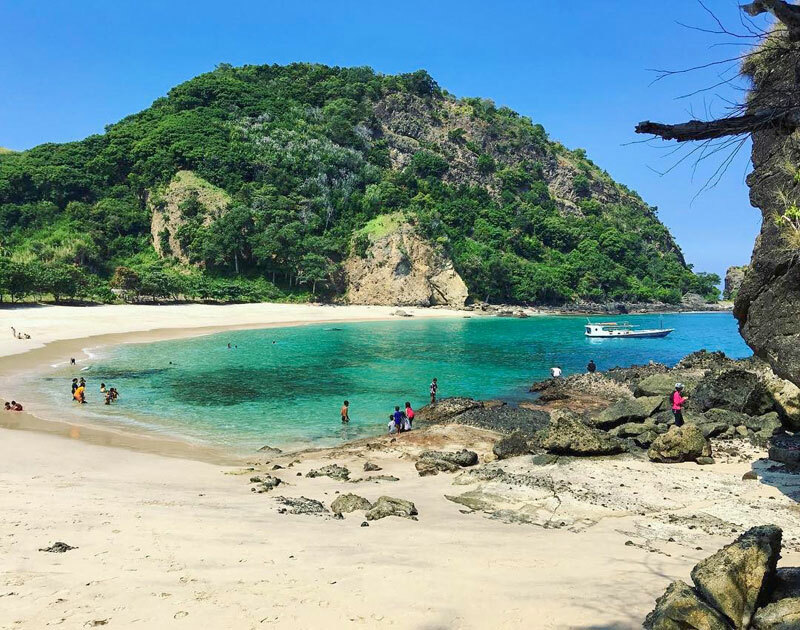 To get to Riung, you’ll have to take the Trans-Flores highway, either from Mbay (about 2 hours), Bajawa (4 hours) or Ende (3-4 hours). A bus will arrive twice a day from Bajawa (called Gemini), but the travelling time will be longer. You can also rent a car (with or without a driver). 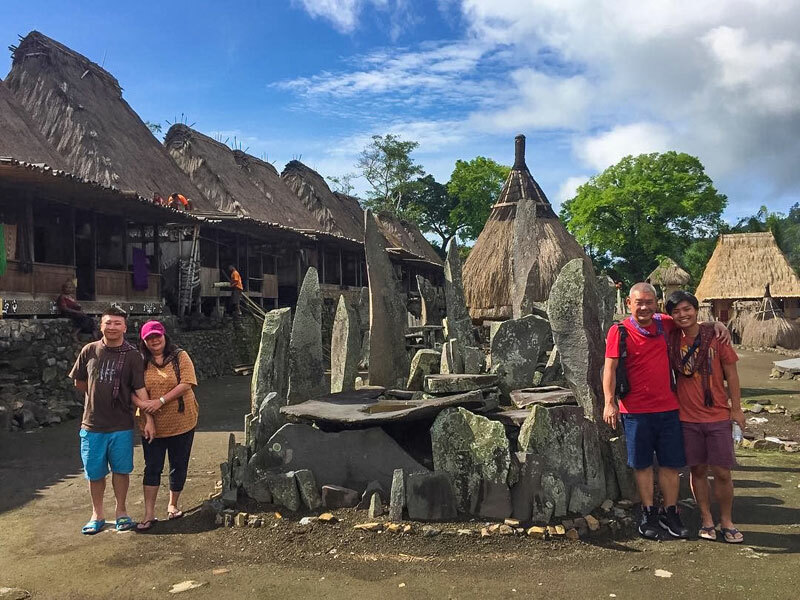 The ancient royal village of Todo has a history that goes back centuries ago, when a king named Mashur and his clan came from Sumatra and decided to settle down in this village. And since then, until the Dutch took over, Todo was the center of Manggarai administration. 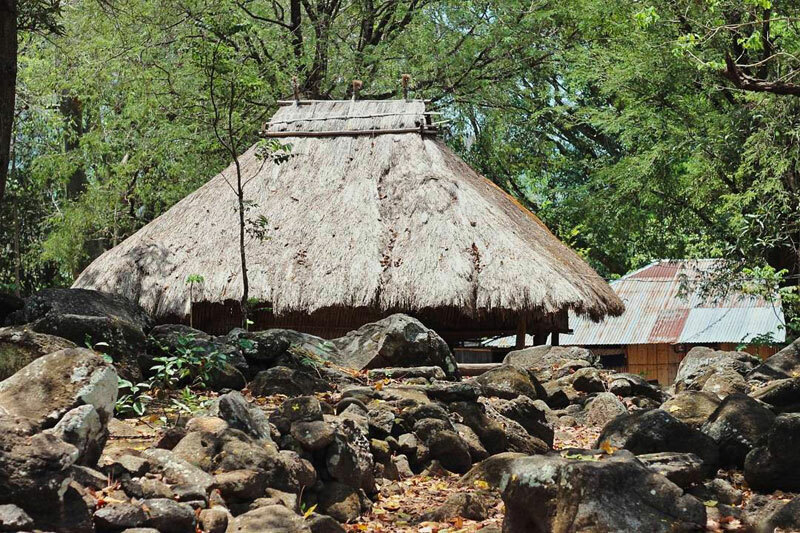 Now you have a chance to visit this ancient royal village and get a peek into the lives of the villagers. The village is situated high up in the mountains, so it offers a beautiful view all around. 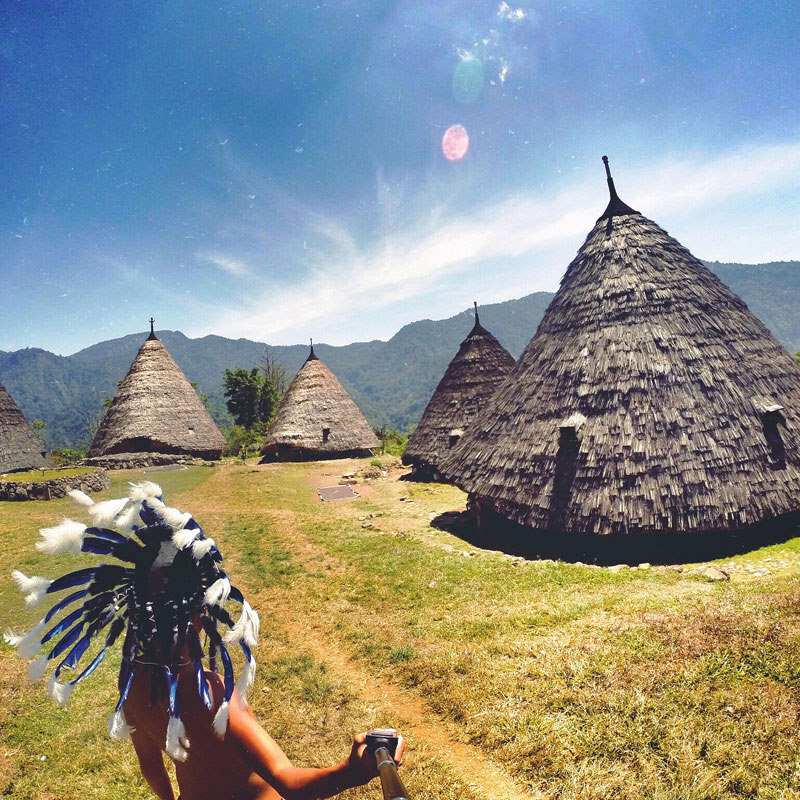 Manggarai culture is characterised by the use of circular forms. You can begin your walk from Watu Todo, the ritual stone, that guards the village and symbolizes its power. Follow a stony path and you’ll get to the “compang”, a circular construction made of rocks. Continue to the ceremonial house, where they worship the ancestors. Here, you’ll fine thatched houses that are about 25 metres in diametre. As you walk in, you’ll notice that the entrance and pillars in the house are decorated with lovely wood carvings. You will also find ritual heirloom drums and gongs! The Todo village is full of myths and legends. One of them tells a story of the “mother drum”. It is believed that the drum was made from a young girl’s skin. The girl was killed by a man of the royal clan, who committed the murder as he didn’t want her to marry another king. The villagers take this drum out only during special ceremonies or for tourists who are willing to pay huge sums of money. 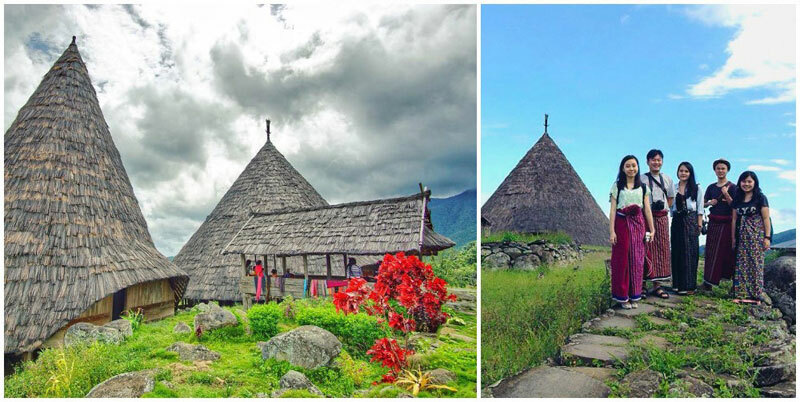 Getting there: Todo Village is situated 36 km (about 2 hours’ drive) southwest from Ruteng. From Ruteng, head north to Golo Lusang. After having passed by Golo Cala, turn right to Pongkor. Pass through Papang and Ulungali Village. From there, cross the Wae Mese River via the long bridge and pass through Popo Village before reaching Todo. Public transport from Ruteng to Todo starts from Mena Bus Terminal in Ruteng and will take about 2.5 to 3 hours.It is also possible to get there by motorbike, but be aware that the last part of the road is quite challenging. Take the main road, go west for about 30km, then follow the sign to the village. 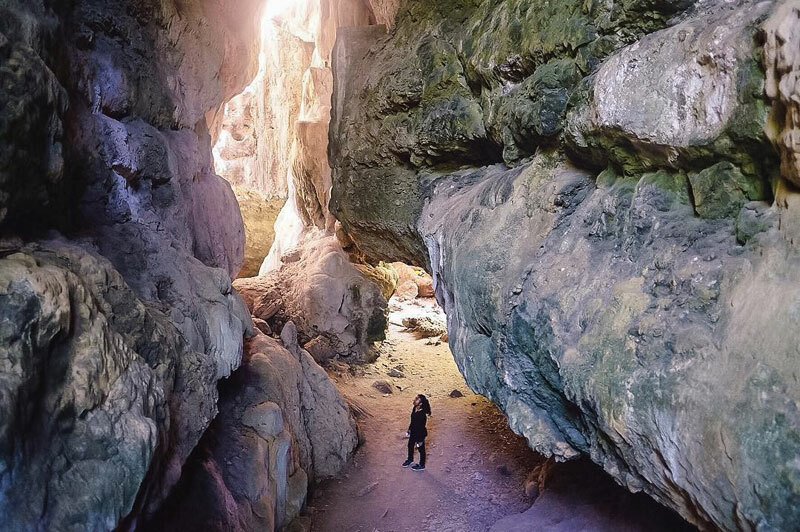 If you are a snake lover, you will love the Snake Palace Cave – a dark, dank cave with a long tube that is hundreds of metres long, which is actually home to snakes (including pythons and other dangerous species) and thousands of bats. The local villagers tell many legends about this mystical place. It is believed a huge snake resides at at the end of the tube, and its skin has faded to white because it never goes out of the cave. They also claim that during the rainy season, the snakes emerge from the cave to prey on dogs and chickens in the village. The locals would say a prayer or even leave a chicken as a sacrifice for the snakes before they enter the cave. To go in, you will need to do a bit of hiking along the slippery muddy path, so it can be pretty challenging. 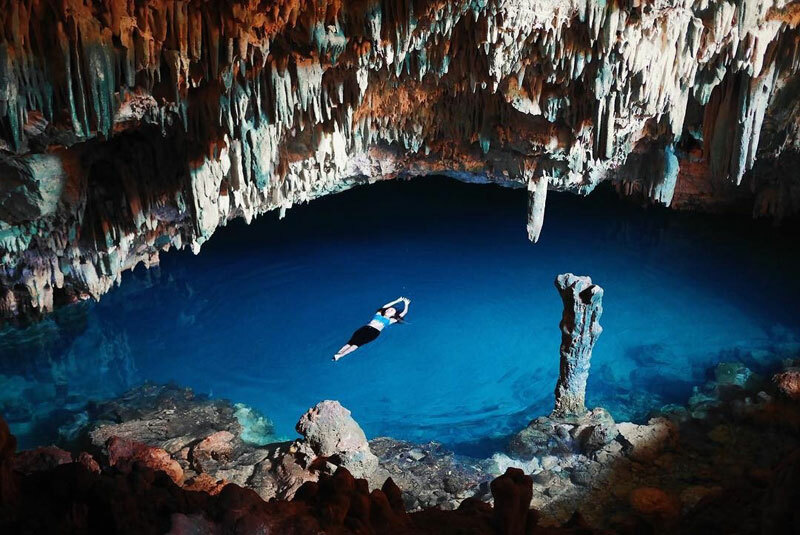 Even if you are really fearless, it is strictly prohibited (and also dangerous) to visit the cave without an experienced guide. 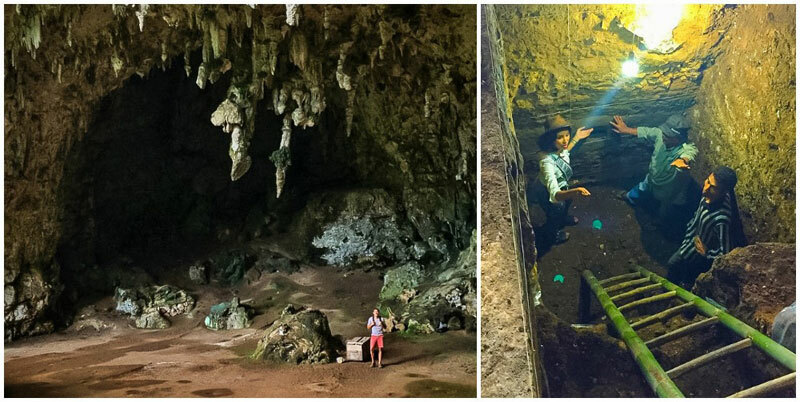 Make sure visit during the dry season (from April to October), as the cave can be flooded otherwise. 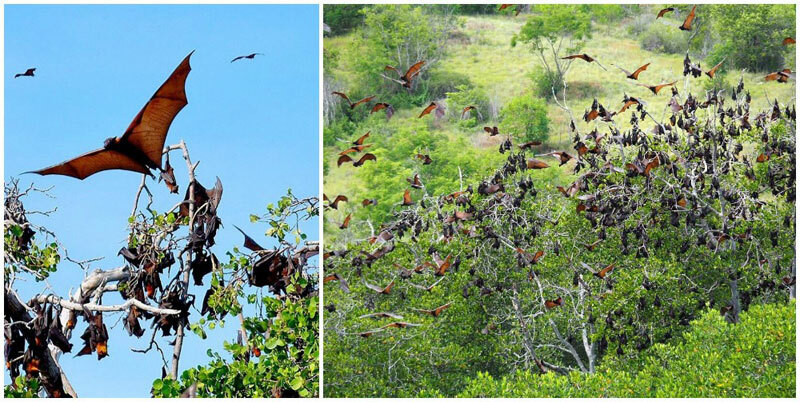 Be warned that the bats in the cave are also known to carry Australian Bat Lyssavirus and antibodies to Hendra virus. 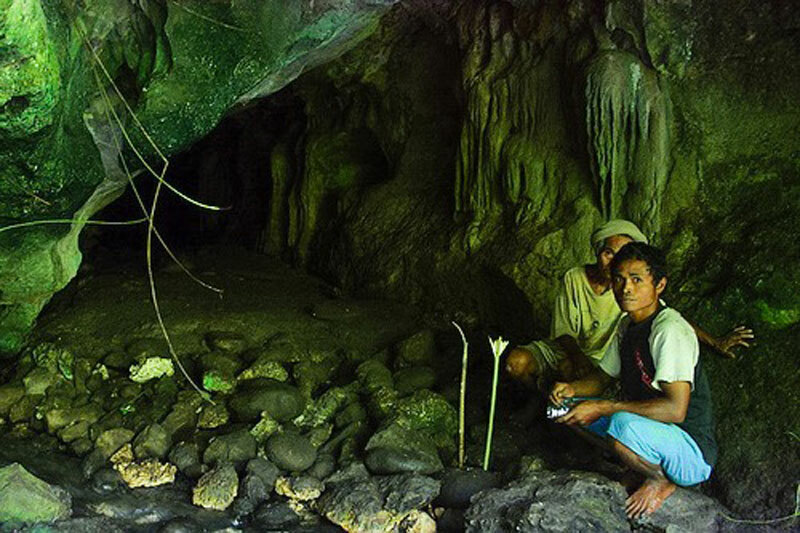 Getting there: The Snake Palace cave is located in Daleng village, 70 km (around 2 hours’ drive) east of Labuan Bajo. It is in between Labuan Bajo and Ruteng. 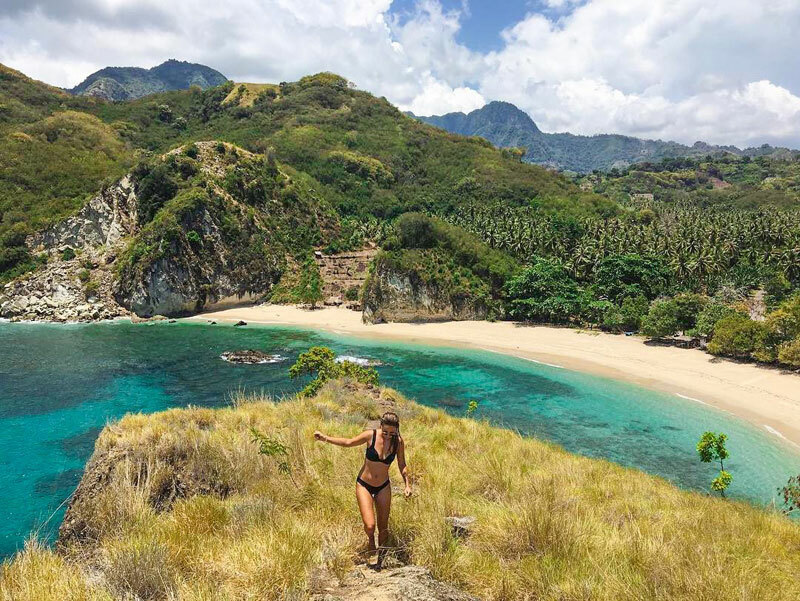 To reach the cave, you’ll need to hike for 40 minutes to the valley, and hire a guide either in Lembor or Daleng village. 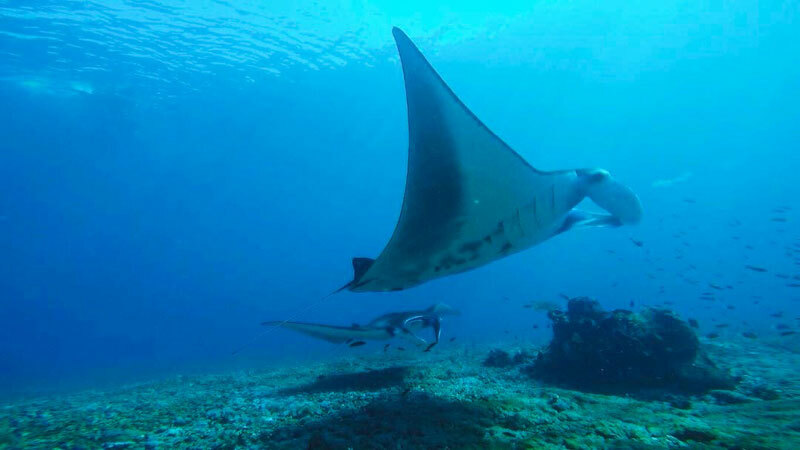 Diving with mantas will pump some adrenaline into your blood! 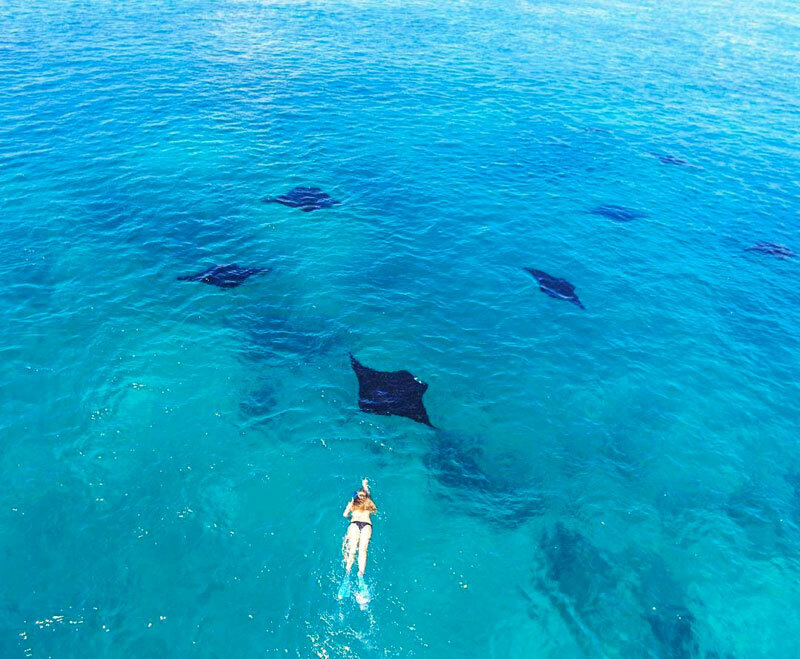 These huge animals will swim all around you, so close that you can even touch them! Getting there: The island is located between Komodo and Rinca. 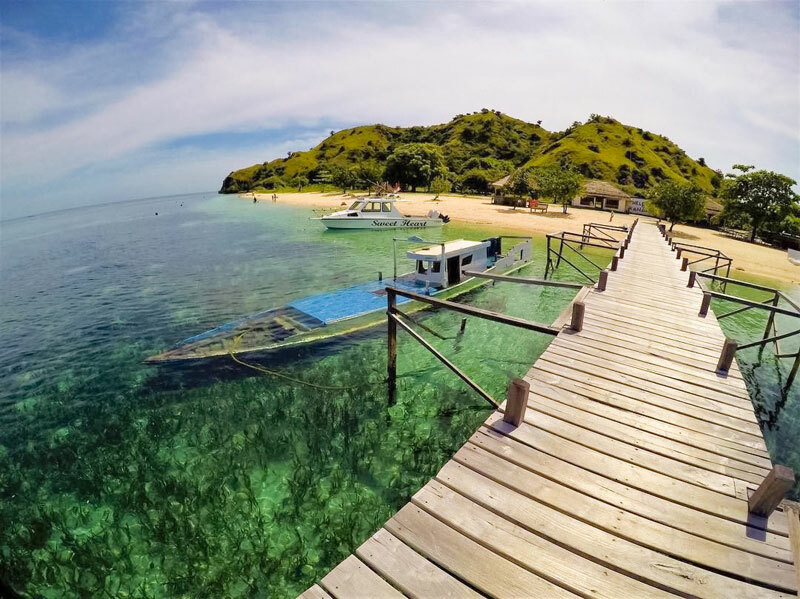 You can organize a diving boat trip from Labuan Bajo. 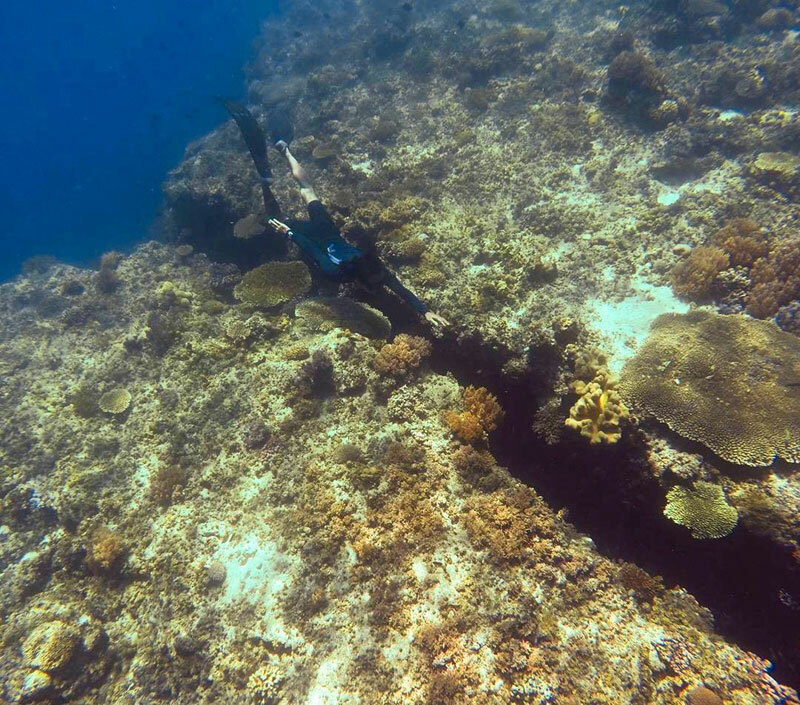 In 1992, an earthquake formed a 70-centimetre-wide and 30-metre-long crack located 20 metres underwater, which actually stretches all the way to the beach. You’ll meet eagle rays, hammerhead sharks, spider crabs, star pufferfish, boxfish, leafscorpiom fish, dartfish and even octopus! 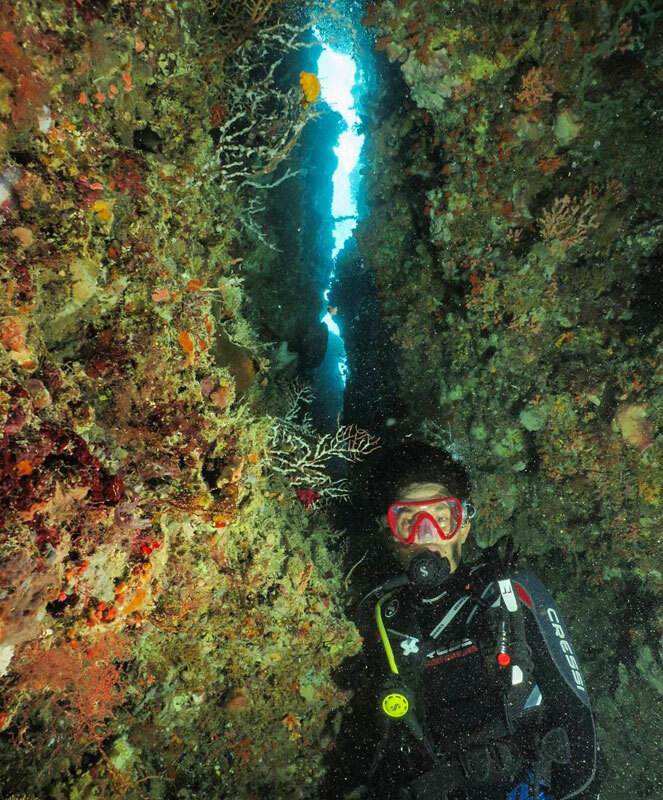 In Seraya Kecil, you can do a night dive. The currents are not strong here, so it’s ideal for beginners. 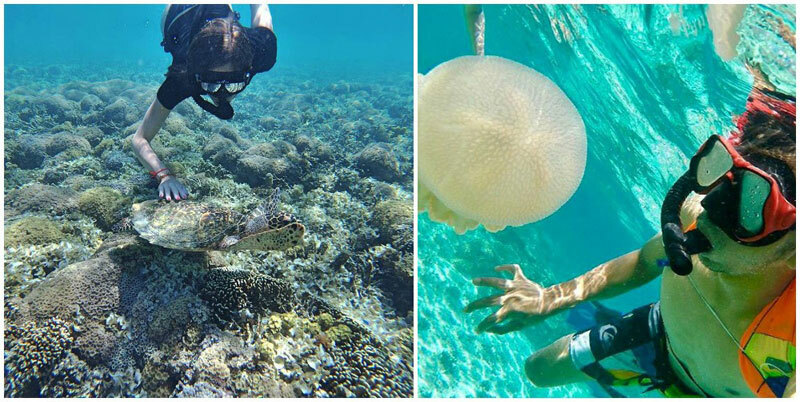 You can spot pygmy seahorses, turtles, stonefish or eagle rays here. 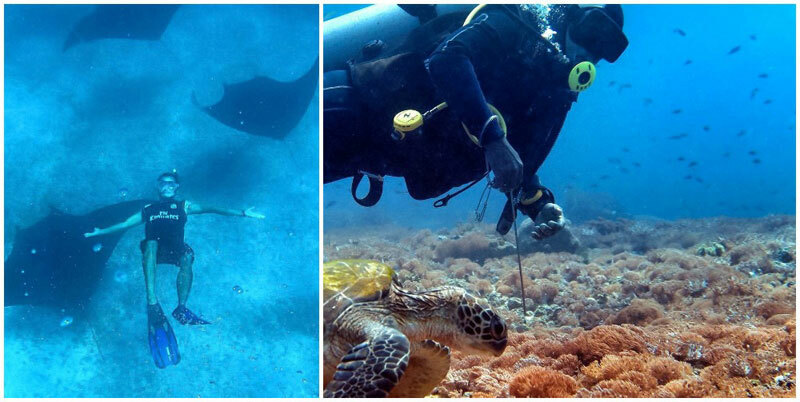 If you are an experienced diver, you can go deeper, and with a bit of luck, you might even meet a reef shark or giant sweetlips. 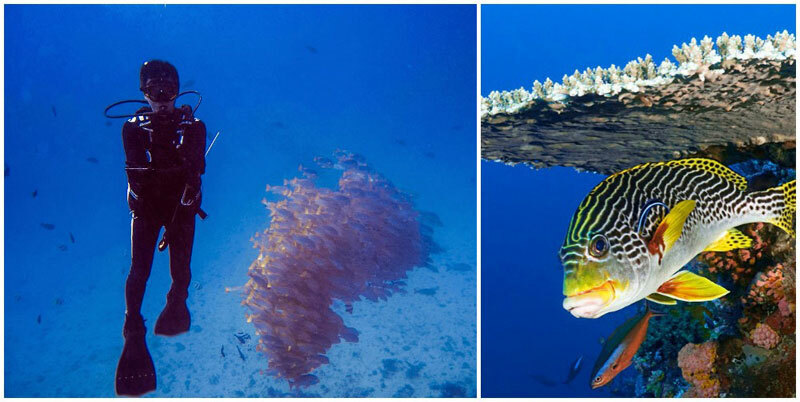 Like being in a bowl of fish soup – that’s how it feels like to dive here. Fish soup usually has very strong currents that attract huge schools of fish. 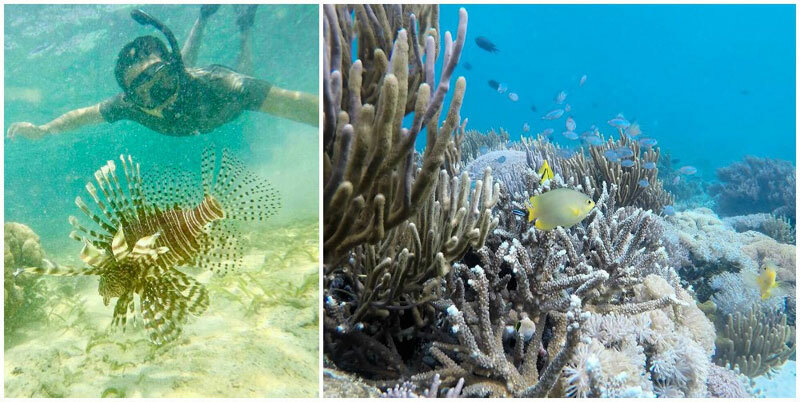 Red tooth triggerfish, wahoo, mackerels, rays and sharks occupy the green coral gardens. Getting there: By boat from Maumere.To experience all four exotic dives, you only need to go on two diving trips. The first departing from Labuan Bajo will take you to Manta Point and Seraya Kecil. The second will take you to The Crack and Fish Soup from Watumita. You can check out this diving centre. 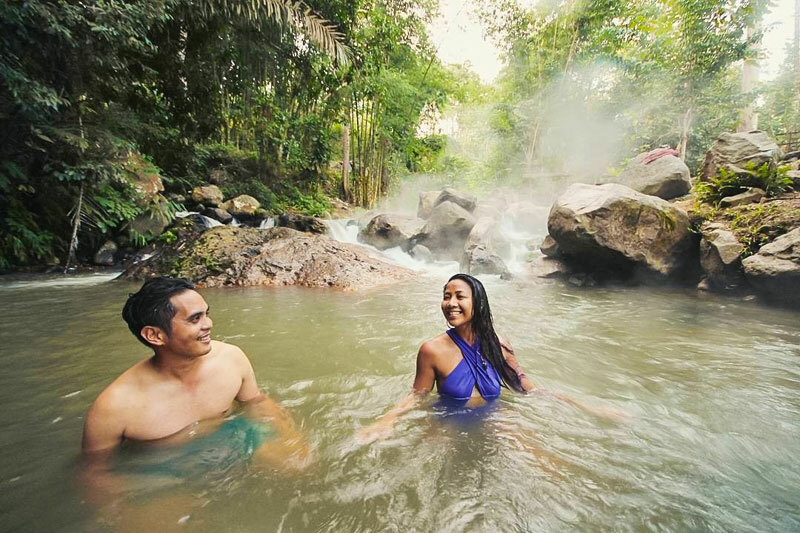 After all the trekking, hiking, diving and snorkelling, what can be better than a nice soak in a natural hot spring? Not many tourists know that there are these “natural spa” near Bajawa. 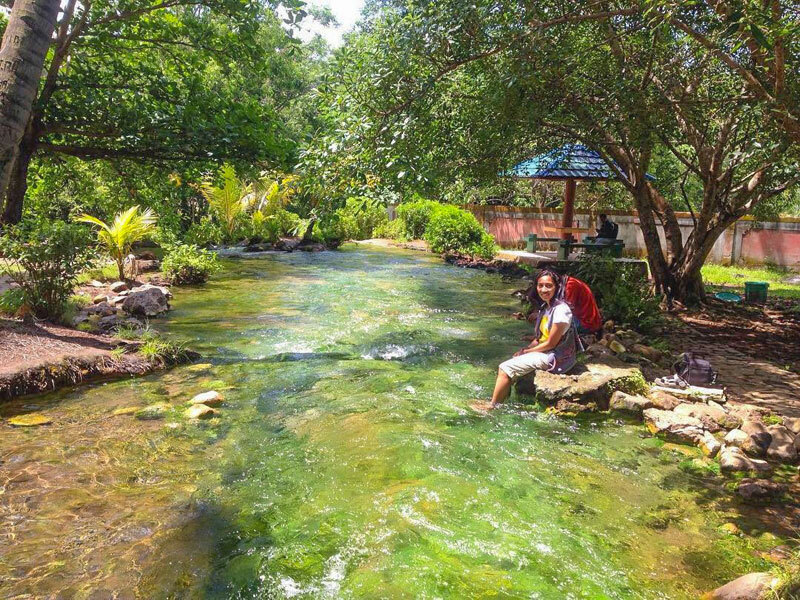 The springs are believed to possess healing properties, so you can soak your aching back and feet after a long trek! 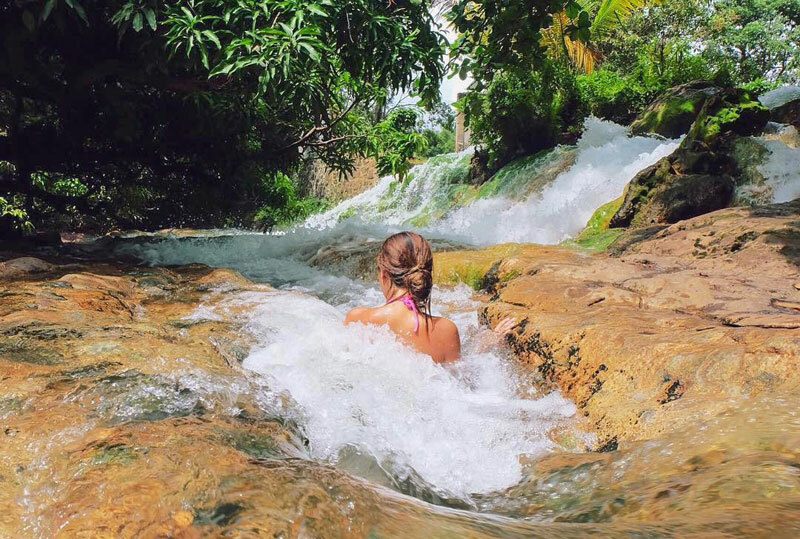 Completely natural and unaltered bubbling pools – that’s what your body needs. There are two currents – a hot one from the volcano and colder one that is mixed with river water. Rich in sulphur, the water is actually beneficial for your skin! Getting there: Located along the Bena Village access road from Bajawa, proceed for 2km after passing Bena Village, and head on to Dariwali Village. The springs are located a short distance off an unpaved road in Naruwolo Village. From there, it’s a short hike down to the springs along a well-formed trail. Alternatively, you can take a 1-hour trek from Gurusina Village. If you don’t have a guide, the locals will point you in the right direction. 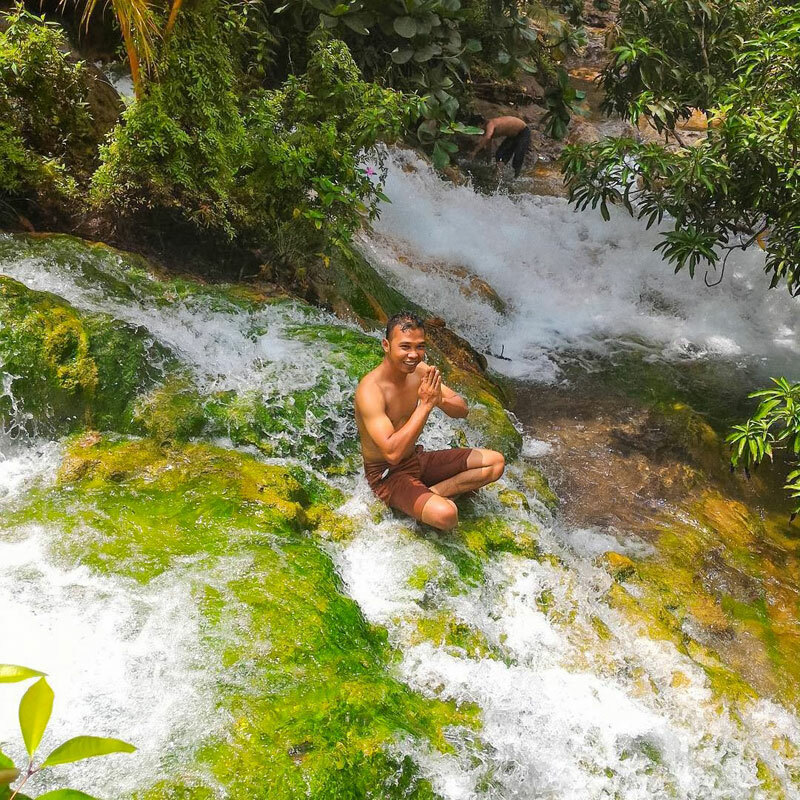 This hot spring is popular among the locals due to its healing properties and beautiful natural scenery all around! Getting there: To reach Mengeruda hot spring, you can take a bemo (small public bus) that runs regularly to Mengeruda Village or any other rental transport from Bajawa. Mengeruda hot spring is located in the Mengeruda Village of Soa sub-district, approximately 25 km from Bajawa. You have to pass by quite a few villages – Naru, Menge, Boba, Gou, Nepa and Soa. Few visitors have heard about Tutubhada village, one of the last villages where traditions are still being kept alive. At the top of the hill sits 14 houses called Sa’o Ji Vao. (In the local language, Sa’o means house, Ji is a word for strength and Vao means shelter.) The houses have uniquely shaped roofs and no walls. Their supporting poles are decorated with beautiful wood carvings and ornaments, while in the interior, you’ll find cultural objects such as a Japanese cannon or buffalo heads. When a new house is built, the villagers hold a special ceremony that involves a buffalo slaughter. The gate to the village is sacred – visitors are not allowed to touch it and they must enter with the right foot first. 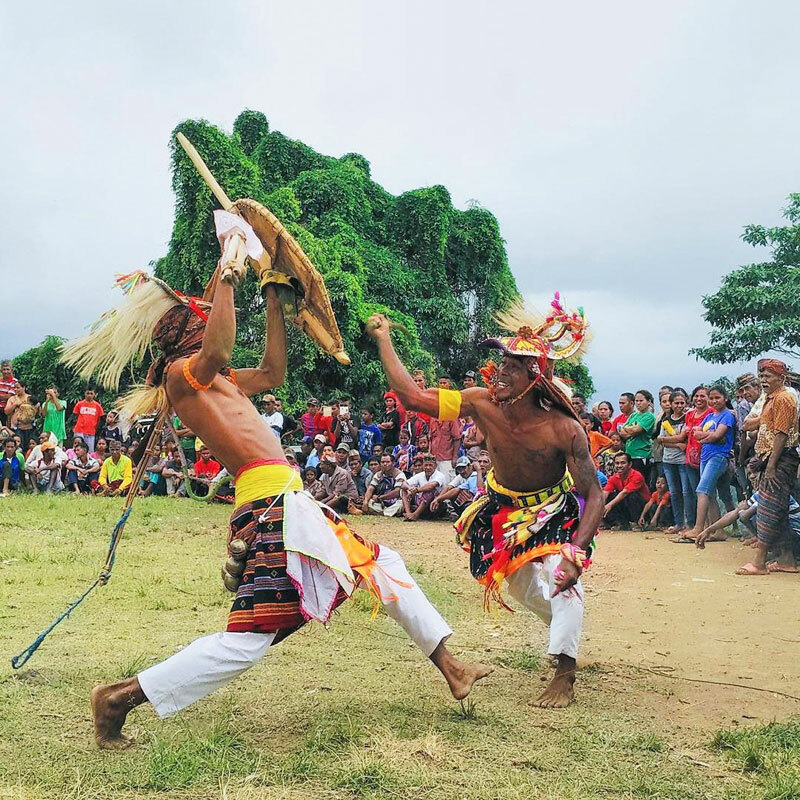 If you are in Tutubadha in June, ask the locals when the time of “Etu” is – it’s a traditional boxing event that can only be seen in central Flores. Getting there: Tutubhada is located in South Aesesa district, approximately 20km from the city of Mbay, the capital of Nagekeo regency. 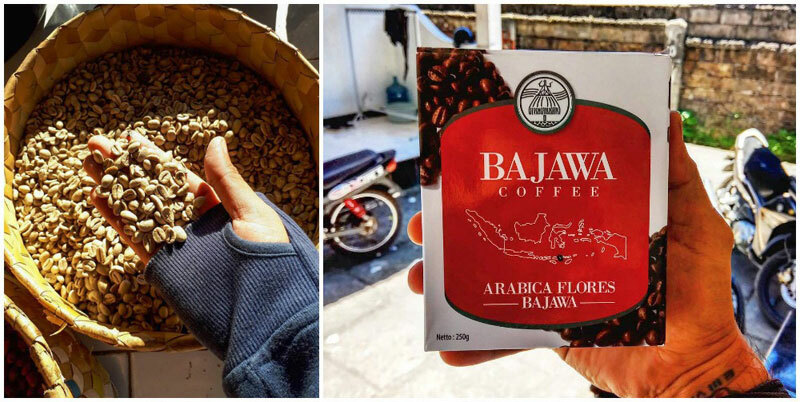 Bajawa coffee, known for its strong flavour and fragrance, is exported to many countries around the world and locals are very proud of it. 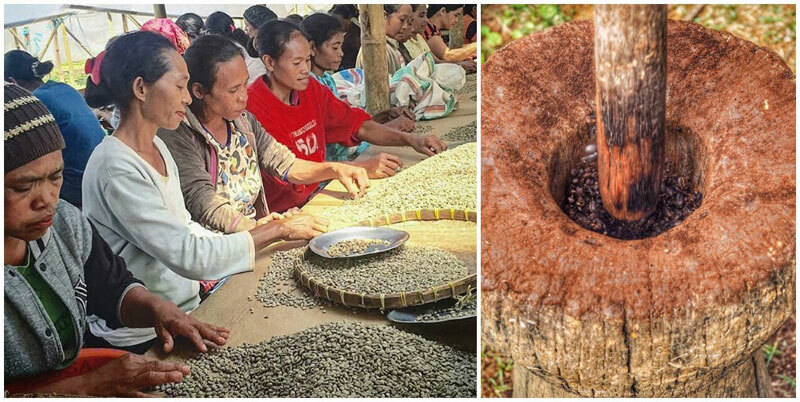 Usually grown using only organic products, the plantations in Bajawa are located about 1300 metres above sea level. The higher the plantations are located, the higher the quality of coffee produced would be. 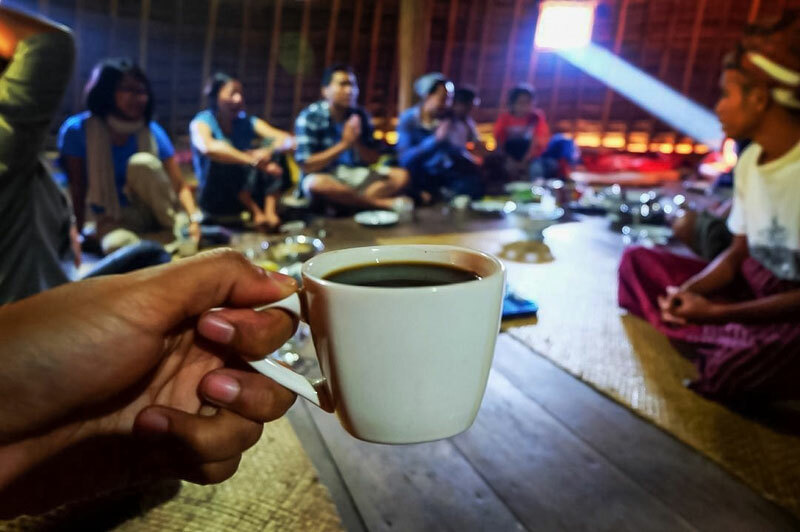 Enjoy a steaming hot cup in one of the traditional villages in Bajawa with the locals, or buy some in the local market and bring it home as a souvenir. 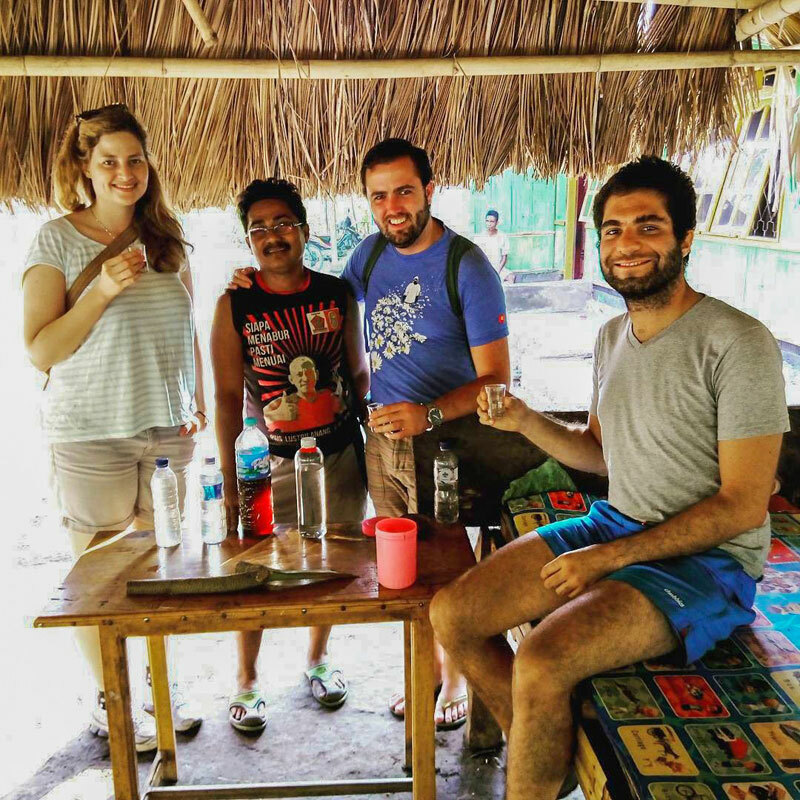 Aimere is the manufacturing centre of arak, the traditional Indonesian spirit liquor. If you are interested to learn more about the process, make a stop in Aimere! Arak is made from palm wine, which is distilled in almost everyone’s home. 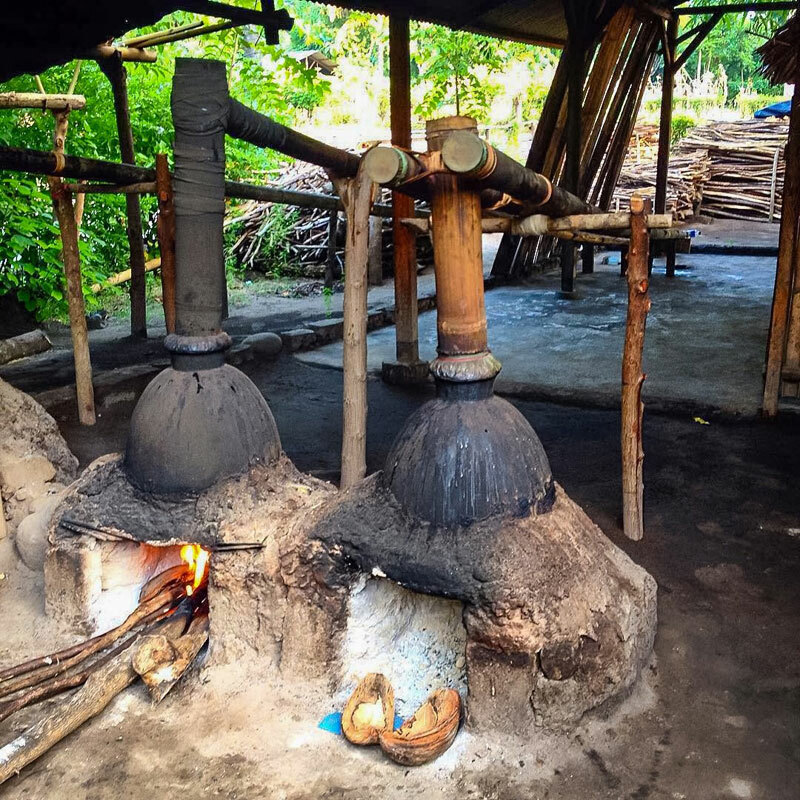 A traditional bamboo distilling system is still used, and locals collect the liquor in plastic bottles. 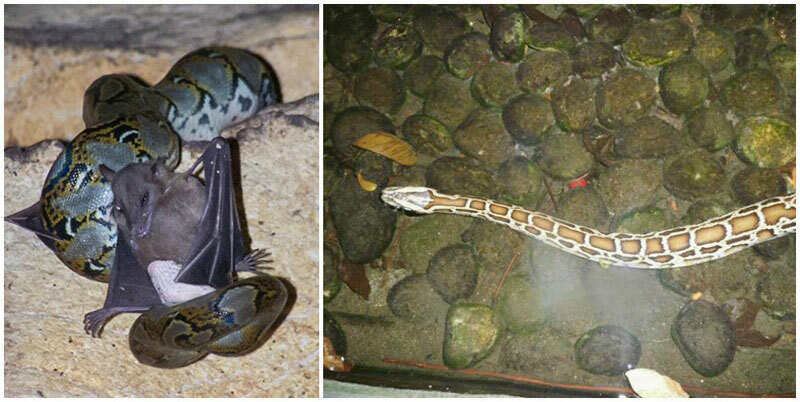 Sometimes, people add dead lizards or snakes into the bottles to give it that extra exotic oomph. Are you brave enough to try it? Who can resist beautiful white sand beaches with crystal clear water? 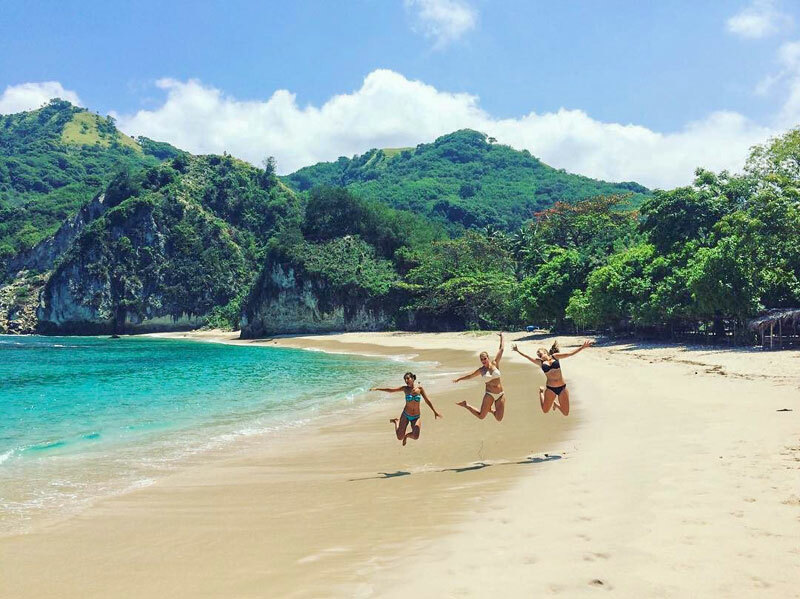 What’s even better – quiet untouched beaches few tourists know about! P.S. This has the same name as another island in Thousand Island (near Jakarta). Getting there: The island is located 30 minutes from Labuan Bajo by boat. A huge rock divides Koka beach into two smaller parts. 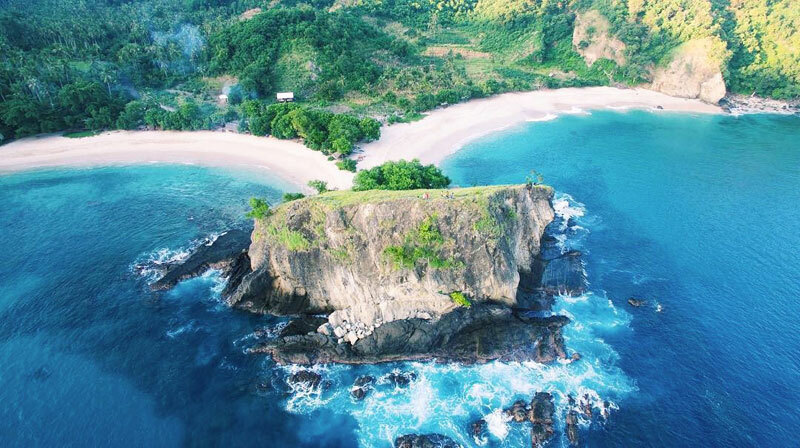 Here, you can sunbathe, snorkel, explore the surroundings and enjoy a freshly cooked fish in a warung! Getting there: You can drive to Koka beach from Maumere (48 km away), or from Wolowaru (35 km away). Apart from being surrounded by hills with a view of the majestic Mount Inerie in the background, Mbalata beach gives you a unique opportunity to experience and immerse yourself in the local rural life. 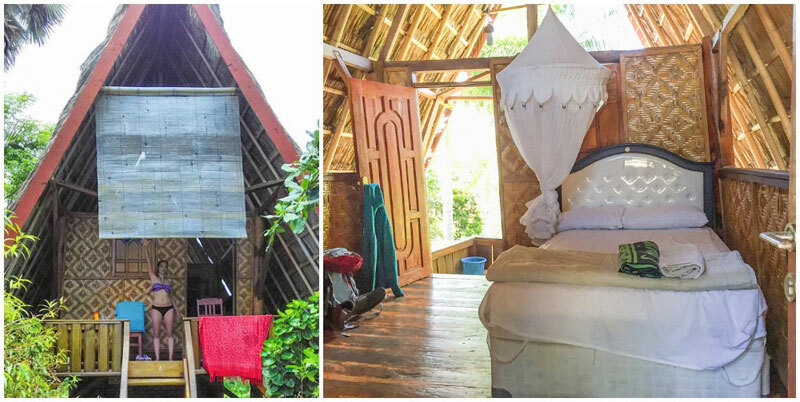 You can stay at the Mbalata Inn Beach Cottages, which is not your ordinary accommodation. 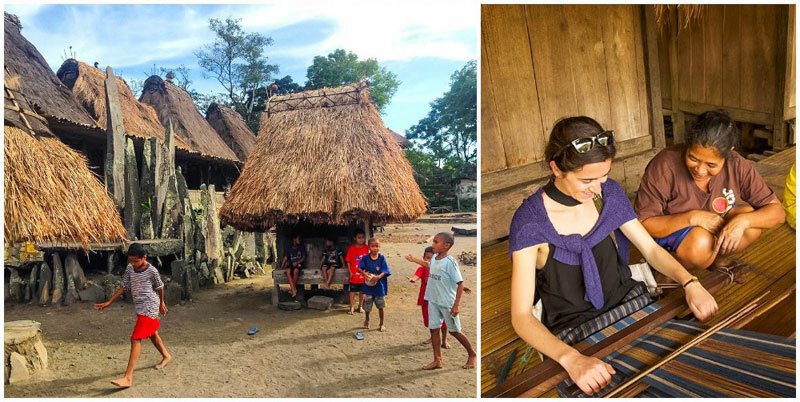 During your stay, you will get to see and interact with farmers working on the rice fields, learn how to make palm sap to produce traditional Manggarai liquor – moke, and you can join the elementary school kids as they clean up the beach. Getting there: Mbalata Beach is in Kotakomba, about 42 km east of Borong. 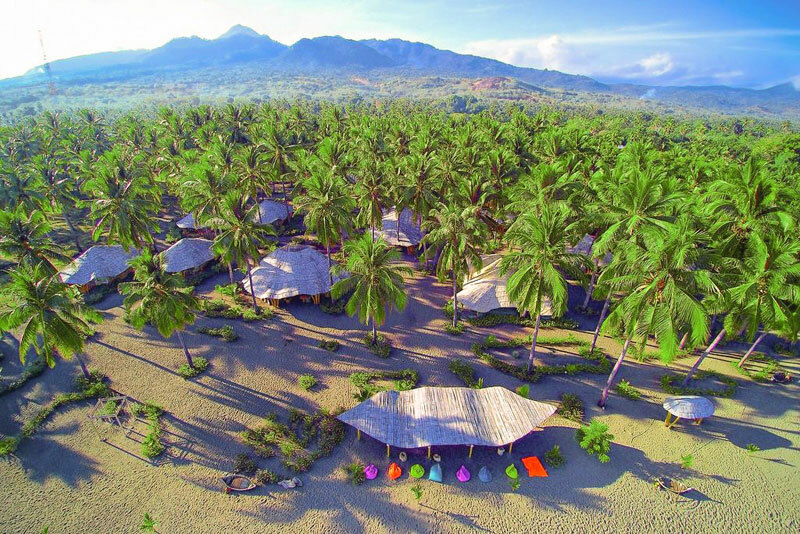 The beach and the cottages are situated close to the Trans-Flores highway between Ruteng and Bajawa.If you come from Bajawa, especially Aimere, you will cross the bridge over the Wae Lengga river. After the bridge, look out for the sign to Mbalata Cottage Beach Inn on your left.From Borong, it will take almost an hour to get there (about 20 km). From this turn, also note that a white concrete gate serves as an entrance. The gate reads ‘Welcome to Mbalata Beach’, and leads you directly to a 300-metre-long stone-paved road to the beach. 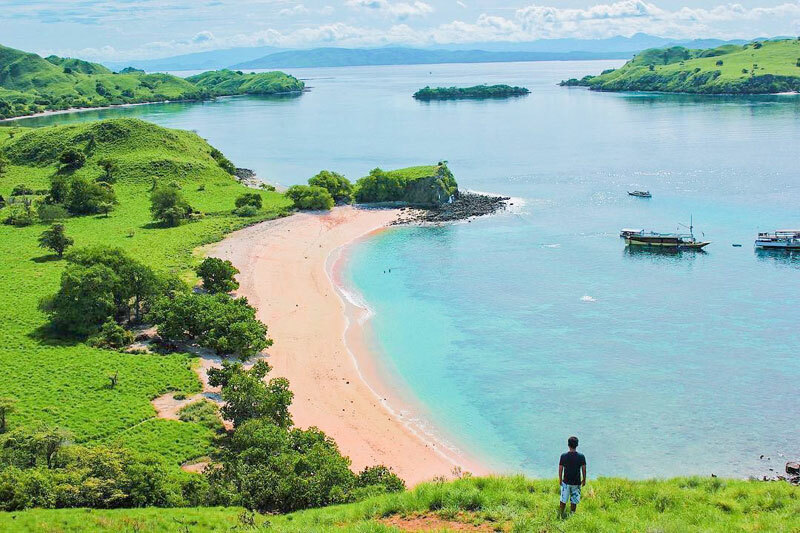 Have you heard of any other must-visit unique locations in Flores? Do comment and let us know!